For other uses, see Colorado River (disambiguation). The Colorado River is one of the principal rivers (along with the Rio Grande) in the Southwestern United States and northern Mexico. The 1,450-mile-long (2,330 km) river drains an expansive, arid watershed that encompasses parts of seven U.S. and two Mexican states. Starting in the central Rocky Mountains of Colorado, the river flows generally southwest across the Colorado Plateau and through the Grand Canyon before reaching Lake Mead on the Arizona–Nevada border, where it turns south toward the international border. After entering Mexico, the Colorado approaches the mostly dry Colorado River Delta at the tip of the Gulf of California between Baja California and Sonora. Known for its dramatic canyons, whitewater rapids, and eleven U.S. National Parks, the Colorado River and its tributaries are a vital source of water for 40 million people. The river and its tributaries are controlled by an extensive system of dams, reservoirs, and aqueducts, which in most years divert its entire flow for agricultural irrigation and domestic water supply. Its large flow and steep gradient are used for generating hydroelectric power, and its major dams regulate peaking power demands in much of the Intermountain West. Intensive water consumption has dried up the lower 100 miles (160 km) of the river, which has rarely reached the sea since the 1960s. Beginning with small bands of nomadic hunter-gatherers, Native Americans have inhabited the Colorado River basin for at least 8,000 years. Between 2,000 and 1,000 years ago, the watershed was home to large agricultural civilizations – considered some of the most sophisticated indigenous North American cultures – which eventually declined due to a combination of severe drought and poor land use practices. Most native peoples that inhabit the region today are descended from other groups that settled there beginning about 1,000 years ago. Europeans first entered the Colorado Basin in the 16th century, when explorers from Spain began mapping and claiming the area, which became part of Mexico upon its independence in 1821. Early contact between Europeans and Native Americans was generally limited to the fur trade in the headwaters and sporadic trade interactions along the lower river. After most of the Colorado River basin became part of the U.S. in 1846, much of the river's course was still the subject of myths and speculation. Several expeditions charted the Colorado in the mid-19th century – one of which, led by John Wesley Powell, was the first to run the rapids of the Grand Canyon. American explorers collected valuable information that was later used to develop the river for navigation and water supply. Large-scale settlement of the lower basin began in the mid- to late-19th century, with steamboats providing transportation from the Gulf of California to landings along the river that linked to wagon roads to the interior. Starting in the 1860s, gold and silver strikes drew prospectors to parts of the upper Colorado River basin. Large engineering works began around the start of the 20th century, with major guidelines established in a series of international and U.S. interstate treaties known as the "Law of the River". The U.S. federal government was the main driving force behind the construction of dams and aqueducts, although many state and local water agencies were also involved. Most of the major dams were built between 1910 and 1970; the system keystone, Hoover Dam, was completed in 1935. The Colorado is now considered among the most controlled and litigated rivers in the world, with every drop of its water fully allocated. The environmental movement in the American Southwest has opposed the damming and diversion of the Colorado River system because of detrimental effects on the ecology and natural beauty of the river and its tributaries. During the construction of Glen Canyon Dam, environmental organizations vowed to block any further development of the river, and a number of later dam and aqueduct proposals were defeated by citizen opposition. As demands for Colorado River water continue to rise, the level of human development and control of the river continues to generate controversy. The Colorado begins at La Poudre Pass in the Southern Rocky Mountains of Colorado, at just under 2 miles (3 km) above sea level. After a short run south, the river turns west below Grand Lake, the largest natural lake in the state. For the first 250 miles (400 km) of its course, the Colorado carves its way through the mountainous Western Slope, a sparsely populated region defined by the portion of the state west of the Continental Divide. As it flows southwest, it gains strength from many small tributaries, as well as larger ones including the Blue, Eagle and Roaring Fork rivers. After passing through De Beque Canyon, the Colorado emerges from the Rockies into the Grand Valley, a major farming and ranching region where it meets one of its largest tributaries, the Gunnison River, at Grand Junction. Most of the upper river is a swift whitewater stream ranging from 200 to 500 feet (60 to 150 m) wide, the depth ranging from 6 to 30 feet (2 to 9 m), with a few notable exceptions, such as the Blackrocks reach where the river is nearly 100 feet (30 m) deep. In a few areas, such as the marshy Kawuneeche Valley near the headwaters and the Grand Valley, it exhibits braided characteristics. Arcing northwest, the Colorado begins to cut across the eponymous Colorado Plateau, a vast area of high desert centered at the Four Corners of the southwestern United States. Here, the climate becomes significantly drier than that in the Rocky Mountains, and the river becomes entrenched in progressively deeper gorges of bare rock, beginning with Ruby Canyon and then Westwater Canyon as it enters Utah, now once again heading southwest. Farther downstream it receives the Dolores River and defines the southern border of Arches National Park, before passing Moab and flowing through "The Portal", where it exits the Moab Valley between a pair of 1,000-foot (300 m) sandstone cliffs. In Utah, the Colorado flows primarily through the "slickrock" country, which is characterized by its narrow canyons and unique "folds" created by the tilting of sedimentary rock layers along faults. This is one of the most inaccessible regions of the continental United States. Below the confluence with the Green River, its largest tributary, in Canyonlands National Park, the Colorado enters Cataract Canyon, named for its dangerous rapids, and then Glen Canyon, known for its arches and erosion-sculpted Navajo sandstone formations. Here, the San Juan River, carrying runoff from the southern slope of Colorado's San Juan Mountains, joins the Colorado from the east. The Colorado then enters northern Arizona, where since the 1960s Glen Canyon Dam near Page has flooded the Glen Canyon reach of the river, forming Lake Powell for water supply and hydroelectricity generation. In Arizona, the river passes Lee's Ferry, an important crossing for early explorers and settlers and since the early 20th century the principal point where Colorado River flows are measured for apportionment to the seven U.S. and two Mexican states in the basin. Downstream, the river enters Marble Canyon, the beginning of the Grand Canyon, passing under the Navajo Bridges on a now southward course. Below the confluence with the Little Colorado River, the river swings west into Granite Gorge, the most dramatic portion of the Grand Canyon, where the river cuts up to one mile (1.6 km) into the Colorado Plateau, exposing some of the oldest visible rocks on Earth, dating as long ago as 2 billion years. The 277 miles (446 km) of the river that flow through the Grand Canyon are largely encompassed by Grand Canyon National Park and are known for their difficult whitewater, separated by pools that reach up to 110 feet (34 m) in depth. At the lower end of Grand Canyon, the Colorado widens into Lake Mead, the largest reservoir in the continental United States, formed by Hoover Dam on the border of Arizona and Nevada. Situated southeast of metropolitan Las Vegas, the dam is an integral component for management of the Colorado River, controlling floods and storing water for farms and cities in the lower Colorado River basin. Below the dam the river passes under the Mike O'Callaghan–Pat Tillman Memorial Bridge – which at nearly 900 feet (270 m) above the water is the highest concrete arch bridge in the Western Hemisphere – and then turns due south towards Mexico, defining the Arizona–Nevada and Arizona–California borders. Satellite view of the Colorado River valley near Yuma, Arizona; the Mexico–United States border runs from left to right just below center. After leaving the confines of the Black Canyon, the river emerges from the Colorado Plateau into the Lower Colorado River Valley (LCRV), a desert region dependent on irrigation agriculture and tourism and also home to several major Indian reservations. The river widens here to a broad, moderately deep waterway averaging 500 to 1,000 feet (150 to 300 m) wide and reaching up to 1⁄4 mile (400 m) across, with depths ranging from 8 to 60 feet (2 to 20 m). Before channelization of the Colorado in the 20th century, the lower river was subject to frequent course changes caused by seasonal flow variations. Joseph C. Ives, who surveyed the lower river in 1861, wrote that "the shifting of the channel, the banks, the islands, the bars is so continual and rapid that a detailed description, derived from the experiences of one trip, would be found incorrect, not only during the subsequent year, but perhaps in the course of a week, or even a day." The LCRV is one of the most densely populated areas along the river, and there are numerous towns including Bullhead City, Arizona, Needles, California, and Lake Havasu City, Arizona. Here, many diversions draw from the river, providing water for both local uses and distant regions including the Salt River Valley of Arizona and metropolitan Southern California. The last major U.S. diversion is at Imperial Dam, where over 90 percent of the river's remaining flow is moved into the All-American Canal to irrigate California's Imperial Valley, the most productive winter agricultural region in the United States. Below Imperial Dam, only a small portion of the Colorado River makes it beyond Yuma, Arizona, and the confluence with the intermittent Gila River – which carries runoff from western New Mexico and most of Arizona – before defining about 24 miles (39 km) of the Mexico–United States border. At Morelos Dam, the entire remaining flow of the Colorado is diverted to irrigate the Mexicali Valley, among Mexico's most fertile agricultural lands. Below San Luis Río Colorado, the Colorado passes entirely into Mexico, defining the Baja California–Sonora border; in most years, the stretch of the Colorado between here and the Gulf of California is dry or a trickle formed by irrigation return flows. The Hardy River provides most of the flow into the Colorado River Delta, a vast alluvial floodplain covering about 3,000 square miles (7,800 km2) of northwestern Mexico. A large estuary is formed here before the Colorado empties into the Gulf about 75 miles (120 km) south of Yuma. Before 20th-century development dewatered the lower Colorado, a major tidal bore was present in the delta and estuary; the first historical record was made by the Croatian missionary in Spanish service Father Ferdinand Konščak on July 18, 1746. During spring tide conditions, the tidal bore – locally called El Burro – formed in the estuary about Montague Island in Baja California and propagated upstream. The Colorado is joined by over 25 significant tributaries, of which the Green River is the largest by both length and discharge. The Green River takes drainage from the Wind River Range of west-central Wyoming, from Utah's Uinta Mountains, and from the Rockies of northwestern Colorado. The Gila River is the second longest and drains a greater area than the Green, but has a significantly lower flow because of a more arid climate and larger diversions for irrigation and cities. Both the Gunnison and San Juan rivers, which derive most of their water from Rocky Mountains snowmelt, contribute more water than the Gila contributed naturally. In its natural state, the Colorado River poured about 16.3 million acre feet (20.1 km3) into the Gulf of California each year, amounting to an average flow rate of 22,500 cubic feet per second (640 m3/s). Its flow regime was not at all steady – indeed, "prior to the construction of federal dams and reservoirs, the Colorado was a river of extremes like no other in the United States." Once, the river reached peaks of more than 100,000 cubic feet per second (2,800 m3/s) in the summer and low flows of less than 2,500 cubic feet per second (71 m3/s) in the winter annually. At Topock, Arizona, about 300 miles (480 km) upstream from the Gulf, a maximum historical discharge of 384,000 cubic feet per second (10,900 m3/s) was recorded in 1884 and a minimum of 422 cubic feet per second (11.9 m3/s) was recorded in 1935. In contrast, the regulated discharge rates on the lower Colorado River below Hoover Dam rarely exceed 35,000 cubic feet per second (990 m3/s) or drop below 4,000 cubic feet per second (110 m3/s). Annual runoff volume has ranged from a high of 22.2 million acre feet (27.4 km3) in 1984 to a low of 3.8 million acre feet (4.7 km3) in 2002, although in most years only a small portion of this flow, if any, reaches the Gulf. Between 85 and 90 percent of the Colorado River's discharge originates in snowmelt, mostly from the Rocky Mountains of Colorado and Wyoming. The three major upper tributaries of the Colorado – the Gunnison, Green, and San Juan – alone deliver almost 9 million acre feet (11 km3) per year to the main stem, mostly from snowmelt. The remaining 10 to 15 percent comes from a variety of sources, principally groundwater base flow and summer monsoon storms. The latter often produces heavy, highly localized floods on lower tributaries of the river, but does not often contribute significant volumes of runoff. Most of the annual runoff in the basin occurs with the melting of Rocky Mountains snowpack, which begins in April and peaks during May and June before exhausting in late July or early August. Flows at the mouth of the river have steadily declined since the beginning of the 20th century, and in most years after 1960 the Colorado River has run dry before reaching the Pacific Ocean. Irrigation, industrial, and municipal diversions, evaporation from reservoirs, natural runoff, and likely climate change, have all contributed to this substantial reduction in flow, threatening the water supply for the future. For example, the Gila River – formerly one of the Colorado's largest tributaries – contributes little more than a trickle in most years due to use of its water by cities and farms in central Arizona. The average flow rate of the Colorado at the northernmost point of the Mexico–United States border (NIB, or Northerly International Boundary) is about 2,060 cubic feet per second (58 m3/s), 1.49 million acre feet (1.84 km3) per year – less than a tenth of the natural flow – due to upstream water use. Below this point, the remaining flow is diverted to irrigate the Mexicali Valley, leaving a dry riverbed from Morelos Dam to the sea that is supplemented by intermittent flows of irrigation drainage water. There have been exceptions, however, namely in the early to mid-1980s, when the Colorado once again reached the sea during several consecutive years of record-breaking precipitation and snowmelt. In 1984, so much excess runoff occurred that some 16.5 million acre feet (20.4 km3), or 22,860 cubic feet per second (647 m3/s), poured into the sea. The United States Geological Survey (USGS) operates or has operated 46 stream gauges to measure the discharge of the Colorado River, ranging from the headwaters near Grand Lake to the Mexico–U.S. border. The tables at right list data associated with eight of these gauges. River flows as gauged at Lee's Ferry, Arizona, about halfway along the length of the Colorado and 16 miles (26 km) below Glen Canyon Dam, are used to determine water allocations in the Colorado River basin. The average discharge recorded there was approximately 14,800 cubic feet per second (420 m3/s), 10.72 million acre feet (13.22 km3) per year, from 1921 to 2010. This figure has been heavily affected by upstream diversions and reservoir evaporation, especially after the completion of the Colorado River Storage Project in the 1970s. Prior to the completion of Glen Canyon Dam in 1964, the average discharge recorded between 1912 and 1962 was 17,850 cubic feet per second (505 m3/s), 12.93 million acre feet (15.95 km3) per year. The drainage basin or watershed of the Colorado River encompasses 246,000 square miles (640,000 km2) of southwestern North America, making it the seventh largest on the continent. About 238,600 square miles (618,000 km2), or 97 percent of the watershed, is in the United States. The river and its tributaries drain most of western Colorado and New Mexico, southwestern Wyoming, eastern and southern Utah, southeastern Nevada and California, and nearly all of Arizona. The areas drained within Baja California and Sonora are very small and do not contribute measurable runoff. Most of the basin is arid, defined by the Sonoran and Mojave deserts and the expanse of the Colorado Plateau, although significant expanses of forest are found in the Rocky Mountains; the Kaibab, Aquarius, and Markagunt plateaus in southern Utah and northern Arizona; the Mogollon Rim through central Arizona; and other smaller mountain ranges and sky islands. Elevations range from sea level at the Gulf of California to 14,321 feet (4,365 m) at the summit of Uncompahgre Peak in Colorado, with an average of 5,500 feet (1,700 m) across the entire basin. Climate varies widely across the watershed. Mean monthly high temperatures are 25.3 °C (77.5 °F) in the upper basin and 33.4 °C (92.1 °F) in the lower basin, and lows average −3.6 and 8.9 °C (25.5 and 48.0 °F), respectively. Annual precipitation averages 6.5 inches (164 mm), ranging from over 40 inches (1,000 mm) in some areas of the Rockies to just 0.6 inches (15 mm) along the Mexican reach of the river. The upper basin generally receives snow and rain during the winter and early spring, while precipitation in the lower basin falls mainly during intense but infrequent summer thunderstorms brought on by the North American Monsoon. As of 2010, approximately 12.7 million people lived in the Colorado River basin. [n 6] Phoenix in Arizona and Las Vegas in Nevada are the largest metropolitan areas in the watershed. Population densities are also high along the lower Colorado River below Davis Dam, which includes Bullhead City, Lake Havasu City, and Yuma. Other significant population centers in the basin include Tucson, Arizona; St. George, Utah; and Grand Junction, Colorado. Colorado River basin states are among the fastest-growing in the U.S.; the population of Nevada alone increased by about 66 percent between 1990 and 2000 as Arizona grew by some 40 percent. The Colorado River basin shares drainage boundaries with many other major watersheds of North America. The Continental Divide of the Americas forms a large portion of the eastern boundary of the watershed, separating it from the basins of the Yellowstone River and the Platte River – both tributaries of the Missouri River – on the northeast, and from the headwaters of the Arkansas River on the east. Both the Missouri and Arkansas rivers are part of the Mississippi River system. Further south, the Colorado River basin borders on the Rio Grande drainage, which along with the Mississippi flows to the Gulf of Mexico, as well as a series of endorheic (closed) drainage basins in southwestern New Mexico and extreme southeastern Arizona. For a short stretch, the Colorado watershed meets the drainage basin of the Snake River, a tributary of the Columbia River, in the Wind River Range of western Wyoming. Southwest of there, the northern divide of the Colorado watershed skirts the edge of the Great Basin, bordering on the closed drainage basins of the Great Salt Lake and the Sevier River in central Utah, and other closed basins in southern Utah and Nevada. To the west in California, the Colorado River watershed borders on those of small closed basins in the Mojave Desert, the largest of which is the Salton Sea drainage north of the Colorado River Delta. On the south, the watersheds of the Sonoyta, Concepción, and Yaqui rivers, all of which drain to the Gulf of California, border that of the Colorado. As recently as the Cretaceous period about 100 million years ago, much of western North America was still part of the Pacific Ocean. Tectonic forces from the collision of the Farallon Plate with the North American Plate pushed up the Rocky Mountains between 50 and 75 million years ago in a mountain-building episode known as the Laramide orogeny. The Colorado River first formed as a west-flowing stream draining the southwestern portion of the range, and the uplift also diverted the Green River, once a tributary of the Mississippi River, west towards the Colorado. About 30 to 20 million years ago, volcanic activity related to the orogeny led to the Mid-Tertiary ignimbrite flare-up, which created smaller formations such as the Chiricahua Mountains in Arizona and deposited massive amounts of volcanic ash and debris over the watershed. The Colorado Plateau first began to rise during the Eocene, between about 55 and 34 million years ago, but did not attain its present height until about 5 million years ago, about when the Colorado River established its present course into the Gulf of California. 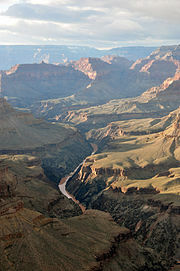 The time scale and sequence over which the river's present course and the Grand Canyon were formed is uncertain. Before the Gulf of California was formed around 12 to 5 million years ago by faulting processes along the boundary of the North American and Pacific plates, the Colorado flowed west to an outlet on the Pacific Ocean – possibly Monterey Bay on the Central California coast, and may have played a role in the formation of the Monterey submarine canyon. Crustal extension in the Basin and Range Province began about 20 million years ago and the modern Sierra Nevada began forming about 10 million years ago, eventually diverting the Colorado southwards towards the Gulf. 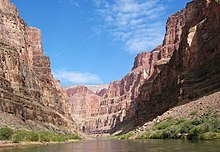 As the Colorado Plateau continued to rise between 5 and 2.5 million years ago, the river maintained its ancestral course (as an antecedent stream) and began to cut the Grand Canyon. Antecedence played a major part in shaping other peculiar geographic features in the watershed, including the Dolores River's bisection of Paradox Valley in Colorado and the Green River's cut through the Uinta Mountains in Utah. Remnants of basalt flows from the Uinkaret volcanic field are seen here descending into the Grand Canyon, where they dammed the Colorado over 10 times in the past 2 million years. Sediments carried from the plateau by the Colorado River created a vast delta made of more than 10,000 cubic miles (42,000 km3) of material that walled off the northernmost part of the gulf in approximately 1 million years. Cut off from the ocean, the portion of the gulf north of the delta eventually evaporated and formed the Salton Sink, which reached about 260 feet (79 m) below sea level. Since then the river has changed course into the Salton Sink at least three times, transforming it into Lake Cahuilla, which at maximum size flooded up the valley to present-day Indio, California. The lake took about 50 years to evaporate after the Colorado resumed flowing to the Gulf. The present-day Salton Sea can be considered the most recent incarnation of Lake Cahuilla, though on a much smaller scale. Between 1.8 million and 10,000 years ago, massive flows of basalt from the Uinkaret volcanic field in northern Arizona dammed the Colorado River within the Grand Canyon. At least 13 lava dams were formed, the largest of which was more than 2,300 feet (700 m) high, backing the river up for nearly 500 miles (800 km) to present-day Moab, Utah. The lack of associated sediment deposits along this stretch of the Colorado River, which would have accumulated in the impounded lakes over time, suggests that most of these dams did not survive for more than a few decades before collapsing or being washed away. Failure of the lava dams caused by erosion, leaks and cavitation caused catastrophic floods, which may have been some of the largest ever to occur in North America, rivaling the late-Pleistocene Missoula Floods of the northwestern United States. Mapping of flood deposits indicate that crests as high as 700 feet (210 m) passed through the Grand Canyon, reaching peak discharges as great as 17 million cubic feet per second (480,000 m3/s). Pueblos and cliff dwellings such as this one in New Mexico were inhabited by people of the Colorado River basin between 2,000 and 700 years ago. The first humans of the Colorado River basin were likely Paleo-Indians of the Clovis and Folsom cultures, who first arrived on the Colorado Plateau about 12,000 years ago. Very little human activity occurred in the watershed until the rise of the Desert Archaic Culture, which from 8,000 to 2,000 years ago constituted most of the region's human population. These prehistoric inhabitants led a generally nomadic lifestyle, gathering plants and hunting small animals (though some of the earliest peoples hunted larger mammals that became extinct in North America after the end of the Pleistocene epoch). Another notable early group was the Fremont culture, whose peoples inhabited the Colorado Plateau from 2,000 to 700 years ago. The Fremont were likely the first peoples of the Colorado River basin to domesticate crops and construct masonry dwellings; they also left behind a large amount of rock art and petroglyphs, many of which have survived to the present day. Beginning in the early centuries A.D., Colorado River basin peoples began to form large agriculture-based societies, some of which lasted hundreds of years and grew into well-organized civilizations encompassing tens of thousands of inhabitants. 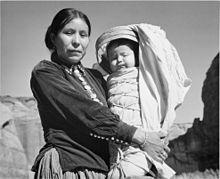 The Ancient Puebloan (also known as Anasazi or Hisatsinom) people of the Four Corners region were descended from the Desert Archaic culture. The Puebloan people developed a complex distribution system to supply drinking and irrigation water in Chaco Canyon in northwestern New Mexico. The Puebloans dominated the basin of the San Juan River, and the center of their civilization was in Chaco Canyon. In Chaco Canyon and the surrounding lands, they built more than 150 multi-story pueblos or "great houses", the largest of which, Pueblo Bonito, is composed of more than 600 rooms. The Hohokam culture was present along the middle Gila River beginning around 1 A.D. Between 600 and 700 A.D. they began to employ irrigation on a large scale, and did so more prolifically than any other native group in the Colorado River basin. An extensive system of irrigation canals was constructed on the Gila and Salt rivers, with various estimates of a total length ranging from 180 to 300 miles (290 to 480 km) and capable of irrigating 25,000 to 250,000 acres (10,000 to 101,000 ha). Both civilizations supported large populations at their height; the Chaco Canyon Puebloans numbered between 6,000 and 15,000 and estimates for the Hohokam range between 30,000 and 200,000. These sedentary peoples heavily exploited their surroundings, practicing logging and harvesting of other resources on a large scale. The construction of irrigation canals may have led to a significant change in the morphology of many waterways in the Colorado River basin. Prior to human contact, rivers such as the Gila, Salt and Chaco were shallow perennial streams with low, vegetated banks and large floodplains. In time, flash floods caused significant downcutting on irrigation canals, which in turn led to the entrenchment of the original streams into arroyos, making agriculture difficult. A variety of methods were employed to combat these problems, including the construction of large dams, but when a megadrought hit the region in the 14th century A.D. the ancient civilizations of the Colorado River basin abruptly collapsed. Some Puebloans migrated to the Rio Grande Valley of central New Mexico and south-central Colorado, becoming the predecessors of the Hopi, Zuni, Laguna and Acoma people in western New Mexico. Many of the tribes that inhabited the Colorado River basin at the time of European contact were descended from Puebloan and Hohokam survivors, while others already had a long history of living in the region or migrated in from bordering lands. The Navajo were an Athabaskan people who migrated from the north into the Colorado River basin around 1025 A.D. They soon established themselves as the dominant Native American tribe in the Colorado River basin, and their territory stretched over parts of present-day Arizona, New Mexico, Utah and Colorado – in the original homelands of the Puebloans. In fact, the Navajo acquired agricultural skills from the Puebloans before the collapse of the Pueblo civilization in the 14th century. A profusion of other tribes have made a continued, lasting presence along the Colorado River. 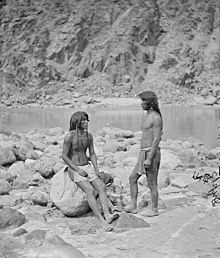 The Mohave have lived along the rich bottomlands of the lower Colorado below Black Canyon since 1200 A.D. They were fishermen – navigating the river on rafts made of reeds to catch Gila trout and Colorado pikeminnow – and farmers, relying on the annual floods of the river rather than irrigation to water their crops. Ute peoples have inhabited the northern Colorado River basin, mainly in present-day Colorado, Wyoming and Utah, for at least 2,000 years, but did not become well established in the Four Corners area until 1500 A.D. The Apache, Cocopah, Halchidhoma, Havasupai, Hualapai, Maricopa, Pima, and Quechan are among many other groups that live along or had territories bordering on the Colorado River and its tributaries. Beginning in the 17th century, contact with Europeans brought significant changes to the lifestyles of Native Americans in the Colorado River basin. Missionaries sought to convert indigenous peoples to Christianity – an effort sometimes successful, such as in Father Eusebio Francisco Kino's 1694 encounter with the "docile Pimas of the Gila Valley [who] readily accepted Kino and his Christian teachings". From 1694 to 1702 Kino would explore the Gila and Colorado Rivers to determine if California was an island or peninsula. The Spanish introduced sheep and goats to the Navajo, who came to rely heavily on them for meat, milk and wool. By the mid-16th century, the Utes, having acquired horses from the Spanish, introduced them to the Colorado River basin. The use of horses spread through the basin via trade between the various tribes and greatly facilitated hunting, communications and travel for indigenous peoples. More warlike groups such as the Utes and Navajos often used horses to their advantage in raids against tribes that were slower to adopt them, such as the Goshutes and Southern Paiutes. The gradual influx of European and American explorers, fortune seekers and settlers into the region eventually led to conflicts that forced many Native Americans off their traditional lands. After the acquisition of the Colorado River basin from Mexico in the Mexican–American War in 1846, U.S. military forces commanded by Kit Carson forced more than 8,000 Navajo men, women and children from their homes after a series of unsuccessful attempts to confine their territory, many of which were met with violent resistance. In what is now known as the Long Walk of the Navajo, the captives were marched from Arizona to Fort Sumner in New Mexico, and many died along the route. Four years later, the Navajo signed a treaty that moved them onto a reservation in the Four Corners region that is now known as the Navajo Nation. It is the largest Native American reservation in the United States, encompassing 27,000 square miles (70,000 km2) with a population of over 180,000 as of 2000. The Mohave were expelled from their territory after a series of minor skirmishes and raids on wagon trains passing through the area in the late 1850s, culminating in an 1859 battle with American forces that concluded the Mohave War. In 1870, the Mohave were relocated to a reservation at Fort Mojave, which spans the borders of Arizona, California and Nevada. Some Mohave were also moved to the 432-square-mile (1,120 km2) Colorado River Indian Reservation on the Arizona–California border, originally established for the Mohave and Chemehuevi people in 1865. In the 1940s, some Hopi and Navajo people were also relocated to this reservation. The four tribes now form a geopolitical body known as the Colorado River Indian Tribes. Water rights of Native Americans in the Colorado River basin were largely ignored during the extensive water resources development carried out on the river and its tributaries in the 19th and 20th centuries. The construction of dams has often had negative impacts on tribal peoples, such as the Chemehuevi when their riverside lands were flooded after the completion of Parker Dam in 1938. Ten Native American tribes in the basin now hold or continue to claim water rights to the Colorado River. The U.S. government has taken some actions to help quantify and develop the water resources of Native American reservations. The first federally funded irrigation project in the U.S. was the construction of an irrigation canal on the Colorado River Indian Reservation in 1867. Other water projects include the Navajo Indian Irrigation Project, authorized in 1962 for the irrigation of lands in part of the Navajo Nation in north-central New Mexico. The Navajo continue to seek expansion of their water rights because of difficulties with the water supply on their reservation; about 40 percent of its inhabitants must haul water by truck many miles to their homes. In the 21st century, they have filed legal claims against the governments of Arizona, New Mexico and Utah for increased water rights. Some of these claims have been successful for the Navajo, such as a 2004 settlement in which they received a 326,000-acre-foot (402,000 ML) allotment from New Mexico. During the 16th century, the Spanish began to explore and colonize western North America. An early motive was the search for the Seven Cities of Gold, or "Cibola", rumored to have been built by Native Americans somewhere in the desert Southwest. According to a United States Geological Survey publication, it is likely that Francisco de Ulloa was the first European to see the Colorado River when in 1536 he sailed to the head of the Gulf of California. Francisco Vásquez de Coronado's 1540–1542 expedition began as a search for the fabled Cities of Gold, but after learning from natives in New Mexico of a large river to the west, he sent García López de Cárdenas to lead a small contingent to find it. With the guidance of Hopi Indians, Cárdenas and his men became the first outsiders to see the Grand Canyon. Cárdenas was reportedly unimpressed with the canyon, assuming the width of the Colorado River at 6 feet (1.8 m) and estimating 300-foot (91 m)-tall rock formations to be the size of a man. After failing at an attempt to descend to the river, they left the area, defeated by the difficult terrain and torrid weather. In 1540, Hernando de Alarcón and his fleet reached the mouth of the river, intending to provide additional supplies to Coronado's expedition. Alarcón may have sailed the Colorado as far upstream as the present-day California–Arizona border. Coronado never reached the Gulf of California, and Alarcón eventually gave up and left. Melchior Díaz reached the delta in the same year, intending to establish contact with Alarcón, but the latter was already gone by the time of Díaz's arrival. 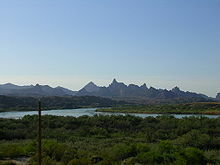 Díaz named the Colorado River Rio del Tizon ("Firebrand River") after seeing a practice used by the local natives for warming themselves. The name Tizon lasted for the next 200 years. The name Rio Colorado ("Red River") was first applied to the Colorado by Father Eusebio Francisco Kino in his maps and written reports resulting from his explorations to the Colorado River Delta and his discovery that California was not an island but a peninsula (1700-1702). Kino's 1701 map, "Paso por Tierra a la California," is the first known map to label the river as the Colorado. During the 18th and early 19th centuries, many Americans and Spanish believed in the existence of the Buenaventura River, purported to run from the Rocky Mountains in Utah or Colorado to the Pacific Ocean. The name Buenaventura was given to the Green River by Silvestre Vélez de Escalante as early as 1776, but Escalante did not know that the Green drained to the Colorado. Many later maps showed the headwaters of the Green and Colorado rivers connecting with the Sevier River (Rio San Ysabel) and Utah Lake (Lake Timpanogos) before flowing west through the Sierra Nevada into California. Mountain man Jedediah Smith reached the lower Colorado by way of the Virgin River canyon in 1826. Smith called the Colorado the "Seedskeedee", as the Green River in Wyoming was known to fur trappers, correctly believing it to be a continuation of the Green and not a separate river as others believed under the Buenaventura myth. John C. Frémont's 1843 Great Basin expedition proved that no river traversed the Great Basin and Sierra Nevada, officially debunking the Buenaventura myth. 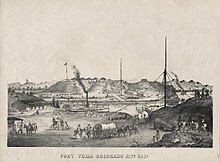 Between 1850 and 1854 the U. S. Army explored the lower reach of the Colorado River from the Gulf of California, looking for the river to provide a less expensive route to supply the remote post of Fort Yuma. First in November 1850 to January 1851, by its transport schooner, Invincible under Captain Alfred H. Wilcox and then by its longboat commanded by Lieutenant George Derby. Later Lieutenant Derby, in his expedition report, recommended that a shallow draft sternwheel steamboat would be the way to send supplies up river to the fort. Lorenzo Sitgreaves led the first Corps of Topographical Engineers mission across northern Arizona to the Colorado River (near modern Bullhead City, Arizona), and down its east bank to the river crossings of the Southern Immigrant Trail at Fort Yuma in 1851. 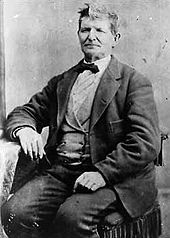 The second Corps of Topographical Engineers expedition passed along and crossed the Colorado was the 1853-1854 Pacific Railroad Survey expedition along the 35th parallel north from Oklahoma to Los Angeles, led by Lt. Amiel Weeks Whipple. George A. Johnson was instrumental in getting the support for Congressional funding a military expedition up the river. With those funds Johnson expected to provide the transportation for the expedition but was angry and disappointed when the commander of the expedition Lt. Joseph Christmas Ives rejected his offer of one of his steamboats. Before Ives could finish reassembling his steamer in the delta, George A. Johnson set off from Fort Yuma on December 31, 1857, conducting his own exploration of the river above the fort in his steamboat General Jesup. He ascended the river in twenty one days as far as the first rapids in Pyramid Canyon, over 300 miles (480 km) above Fort Yuma and 8 miles (13 km) above the modern site of Davis Dam. Running low on food he turned back. :16–17,19 As he returned he encountered Lieutenant Ives, Whipple's assistant, who was leading an expedition to explore the feasibility of using the Colorado River as a navigation route in the Southwest. Ives and his men used a specially built steamboat, the shallow-draft U.S.S. Explorer, and traveled up the river as far as Black Canyon. He then took a small boat up beyond the canyon to Fortification Rock and Las Vegas Wash.:Part 1, 85–87 After experiencing numerous groundings and accidents and having been inhibited by low water in the river, Ives declared: "Ours has been the first, and will doubtless be the last, party of whites to visit this profitless locality. It seems intended by nature that the Colorado River, along the greater portion of its lonely and majestic way, shall be forever unvisited and undisturbed." We are now ready to start on our way down the Great Unknown. Our boats, tied to a common stake, are chafing each other, as they are tossed by the fretful river. They ride high and buoyant, for their loads are lighter than we could desire. We have but a month's rations remaining. The flour has been re-sifted through the mosquito net sieve; the spoiled bacon has been dried, and the worst of it boiled; the few pounds of dried apples have been spread in the sun, and re-shrunken to their normal bulk; the sugar has all melted, and gone on its way down the river; but we have a large sack of coffee. The lighting of the boats has this advantage: they will ride the waves better, and we shall have little to carry when we make a portage. We are three-quarters of a mile in the depths of the earth, and the great river shrinks into insignificance, as it dashes its angry waves against the walls and cliffs, that rise to the world above; they are but puny ripples, and we but pigmies, running up and down the sands, or lost among the boulders. We have an unknown distance yet to run; an unknown river yet to explore. What falls there are, we know not; what rocks beset the channel, we know not; what walls rise over the river, we know not; Ah, well! we may conjecture many things. The men talk as cheerfully as ever; jests are bandied about freely this morning; but to me the cheer is somber and the jests are ghastly. On August 28, 1869, three men deserted the expedition, convinced that they could not possibly survive the trip through the Grand Canyon. They were killed by Native Americans after making it to the rim of the canyon; two days later, the expedition ran the last of the Grand Canyon rapids and reached St. Thomas. Powell led a second expedition in 1871, this time with financial backing from the U.S. government. The explorers named many features along the Colorado and Green rivers, including Glen Canyon, the Dirty Devil River, Flaming Gorge, and the Gates of Lodore. 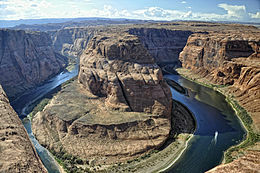 In what is perhaps a twist of irony, modern-day Lake Powell, which floods Glen Canyon, is also named for their leader. Starting in the latter half of the 19th century, the lower Colorado below Black Canyon became an important waterway for steamboat commerce. In 1852, the Uncle Sam was launched to provide supplies to the U.S. Army outpost at Fort Yuma. Although this vessel accidentally foundered and sank early in its career, commercial traffic quickly proliferated because river transport was much cheaper than hauling freight over land. Navigation on the Colorado River was dangerous because of the shallow channel and flow variations, so the first sternwheeler on the river, the Colorado of 1855, was designed to carry 60 short tons (54 t) while drawing less than 2 feet (0.6 m) of water. The tidal bore of the lower Colorado also presented a major hazard; in 1922, a 15-foot (4.6 m)-high wave swamped a ship bound for Yuma, killing between 86 and 130 people. Steamboats quickly became the principal source of communication and trade along the river until competition from railroads began in the 1870s, and finally the construction of dams along the lower river in 1909, none of which had locks to allow the passage of ships. During the Manifest Destiny era of the mid-19th century, American pioneers settled many western states but generally avoided the Colorado River basin until the 1850s. Under Brigham Young's grand vision for a "vast empire in the desert", (the State of Deseret) Mormon settlers were among the first whites to establish a permanent presence in the watershed, Fort Clara or Fort Santa Clara, in the winter of 1855-1856 along the Santa Clara River, tributary of the Virgin River. In the lower Colorado mining was the primary spur to economic development, copper mining in southwestern New Mexico Territory the 1850s then the Mohave War and a gold rush on the Gila River in 1859, the El Dorado Canyon Rush in 1860 and Colorado River Gold Rush in 1862. John D. Lee, date and photographer unknown. He established a permanent ferry across the Colorado. Mormons founded settlements along the Duchesne River Valley in the 1870s, and populated the Little Colorado River valley later in the century, settling in towns such as St. Johns, Arizona. They also established settlements along the Gila River in central Arizona beginning in 1871. These early settlers were impressed by the extensive ruins of the Hohokam civilization that previously occupied the Gila River valley, and are said to have "envisioned their new agricultural civilization rising as the mythical phoenix bird from the ashes of Hohokam society". The Mormons were the first whites to develop the water resources of the basin on a large scale, and built complex networks of dams and canals to irrigate wheat, oats and barley in addition to establishing extensive sheep and cattle ranches. One of the main reasons the Mormons were able to colonize Arizona was the existence of Jacob Hamblin's ferry across the Colorado at Lee's Ferry (then known as Pahreah Crossing), which began running in March 1864. This location was the only section of river for hundreds of miles in both directions where the canyon walls dropped away, allowing for the development of a transport route. John Doyle Lee established a more permanent ferry system at the site in 1870. One reason Lee chose to run the ferry was to flee from Mormon leaders who held him responsible for the Mountain Meadows Massacre, in which 120 emigrants in a wagon train were killed by a local militia disguised as Native Americans. Even though it was located along a major travel route, Lee's Ferry was very isolated, and there Lee and his family established the aptly named Lonely Dell Ranch. In 1928, the ferry sank, resulting in the deaths of three men. Later that year, the Navajo Bridge was completed at a point 5 miles (8 km) downstream, rendering the ferry obsolete. Gold strikes from the mid-19th to early 20th centuries played a major role in attracting settlers to the upper Colorado River basin. In 1859, a group of adventurers from Georgia discovered gold along the Blue River in Colorado and established the mining boomtown of Breckenridge. During 1875, even bigger strikes were made along the Uncompahgre and San Miguel rivers, also in Colorado, and these led to the creation of Ouray and Telluride, respectively. Because most gold deposits along the upper Colorado River and its tributaries occur in lode deposits, extensive mining systems and heavy machinery were required to extract them. Mining remains a substantial contributor to the economy of the upper basin and has led to acid mine drainage problems in some regional streams and rivers. Prior to 1921, the upper Colorado River above the confluence with the Green River in Utah had assumed various names. Fathers Dominguez and Escalante named it Rio San Rafael in 1776. Through the mid-1800s, the river between Green River and the Gunnison River was most commonly known as the Grand River. The river above the junction with the Gunnison River, however, was known variously as the Bunkara River, the North Fork of the Grand River, the Blue River, and the Grand River. The latter name did not become consistently applied until the 1870s. Glen Canyon Dam (right) forms Lake Powell, the second-largest reservoir on the Colorado River with a capacity of more than 24.3 million acre feet (3.00×1010 m3). The Colorado River is the sole source of water for the Imperial Valley in southern California, one of the most productive agricultural regions in the U.S.
Today, between 36 and 40 million people depend on the Colorado River's water for agricultural, industrial and domestic needs. Southern Nevada Water Authority called the Colorado River one of the "most controlled, controversial and litigated rivers in the world". Over 29 major dams and hundreds of miles of canals serve to supply thirsty cities, provide irrigation water to some 4 million acres (1.6 million hectares), and meet peaking power demands in the Southwest, generating more than 12 billion kWh of hydroelectricity each year. Often called "America's Nile", the Colorado is so carefully managed – with basin reservoirs capable of holding four times the river's annual flow – that each drop of its water is used an average of 17 times in a single year. One of the earliest water projects in the Colorado River basin was the Grand Ditch, a 16-mile (26 km) diversion canal that sends water from the Never Summer Mountains, which would naturally have drained into the headwaters of the Colorado River, to bolster supplies in Colorado's Front Range Urban Corridor. Constructed primarily by Japanese and Mexican laborers, the ditch was considered an engineering marvel when completed in 1890, delivering 17,700 acre feet (21,800 ML) across the Continental Divide each year. Because roughly 75 percent of Colorado's precipitation falls west of the Rocky Mountains while 80 percent of the population lives east of the range, more of these interbasin water transfers, locally known as transmountain diversions, followed. While first envisioned in the late 19th century, construction on the Colorado-Big Thompson Project (C-BT) did not begin until the 1930s. The C-BT now delivers more than 11 times the Grand Ditch's flow from the Colorado River watershed to cities along the Front Range. Meanwhile, large-scale development was also beginning on the opposite end of the Colorado River. 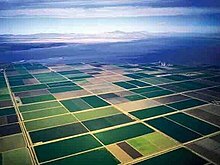 In 1900, entrepreneurs of the California Development Company (CDC) looked to the Imperial Valley of southern California as an excellent location to develop agriculture irrigated by the waters of the river. Engineer George Chaffey was hired to design the Alamo Canal, which split off from the Colorado River near Pilot Knob, curved south into Mexico, and dumped into the Alamo River, a dry arroyo which had historically carried flood flows of the Colorado into the Salton Sink. With a stable year-round flow in the Alamo River, irrigators in the Imperial Valley were able to begin large-scale farming, and small towns in the region started to expand with the influx of job-seeking migrants. By 1903, more than 100,000 acres (40,000 ha) in the valley were under cultivation, supporting a growing population of 4,000. It was not long before the Colorado River began to wreak havoc with its erratic flows. In autumn, the river would drop below the level of the canal inlet, and temporary brush diversion dams had to be constructed. In early 1905, heavy floods destroyed the headworks of the canal, and water began to flow uncontrolled down the canal towards the Salton Sink. On August 9, the entire flow of the Colorado swerved into the canal and began to flood the bottom of the Imperial Valley. In a desperate gamble to close the breach, crews of the Southern Pacific Railroad, whose tracks ran through the valley, attempted to dam the Colorado above the canal, only to see their work demolished by a flash flood. It took seven attempts, more than $3 million, and two years for the railroad, the CDC, and the federal government to permanently block the breach and send the Colorado on its natural course to the gulf – but not before part of the Imperial Valley was flooded under a 45-mile-long (72 km) lake, today's Salton Sea. After the immediate flooding threat passed, it was realized that a more permanent solution would be needed to rein in the Colorado. In 1922, six U.S. states in the Colorado River basin signed the Colorado River Compact, which divided half of the river's flow to both the Upper Basin (the drainage area above Lee's Ferry, comprising parts of Colorado, New Mexico, Utah, and Wyoming and a small portion of Arizona) and the Lower Basin (Arizona, California, Nevada, and parts of New Mexico and Utah). Each was given rights to 7.5 million acre feet (9.3 km3) of water per year, a figure believed to represent half of the river's minimum flow at Lee's Ferry. This was followed by a U.S.–Mexico treaty in 1944, allocating 1.5 million acre feet (1.9 km3) of Colorado River water to the latter country per annum. Arizona refused to ratify the Colorado River Compact in 1922 because it feared that California would take too much of the lower basin allotment; in 1944 a compromise was reached in which Arizona would get a firm allocation of 2.8 million acre feet (3.5 km3), but only if California's 4.4-million-acre-foot (5.4 km3) allocation was prioritized during drought years. These and nine other decisions, compacts, federal acts and agreements made between 1922 and 1973 form what is now known as the Law of the River. On September 30, 1935, the United States Bureau of Reclamation (USBR) completed Hoover Dam in the Black Canyon of the Colorado River. Behind the dam rose Lake Mead, the largest artificial lake in the U.S., capable of holding more than two years of the Colorado's flow. The construction of Hoover was a major step towards stabilizing the lower channel of the Colorado River, storing water for irrigation in times of drought, and providing much-needed flood control as part of a program known as the Boulder Canyon Project. Hoover was the tallest dam in the world at the time of construction and also had the world's largest hydroelectric power plant. Flow regulation from Hoover Dam opened the doors for rapid development on the lower Colorado River; Imperial and Parker dams followed in 1938, and Davis Dam was completed in 1950. Completed in 1938 some 20 miles (32 km) above Yuma, Imperial Dam diverts nearly all of the Colorado's flow into two irrigation canals. The All-American Canal, built as a permanent replacement for the Alamo Canal, is so named because it lies completely within the U.S., unlike its ill–fated predecessor. With a capacity of over 26,000 cubic feet per second (740 m3/s), the All-American is the largest irrigation canal in the world, supplying water to 500,000 acres (2,000 km2) of California's Imperial Valley. Because the valley's warm and sunny climate lends to a year-round growing season in addition to the large water supply furnished by the Colorado, the Imperial Valley is now one of the most productive agricultural regions in North America. In 1957, the USBR completed a second canal, the Gila Gravity Main Canal, to irrigate about 110,000 acres (450 km2) in southwestern Arizona with Colorado River water as part of the Gila Project. The Lower Basin states also sought to develop the Colorado for municipal supplies. Central Arizona initially relied on the Gila River and its tributaries through projects such as the Theodore Roosevelt and Coolidge Dams – completed in 1911 and 1928, respectively. Roosevelt was the first large dam constructed by the USBR and provided the water needed to start large-scale agricultural and urban development in the region. The Colorado River Aqueduct, which delivers water nearly 250 miles (400 km) from near Parker Dam to 10 million people in the Los Angeles metropolitan area, was completed in 1941. The San Diego Aqueduct branch, whose initial phase was complete by 1947, furnishes water to nearly 3 million people in San Diego and its suburbs. The Las Vegas Valley of Nevada experienced rapid growth in part due to Hoover Dam construction, and Las Vegas had tapped a pipeline into Lake Mead by 1937. Nevada officials, believing that groundwater resources in the southern part of the state were sufficient for future growth, were more concerned with securing a large amount of the dam's power supply than water from the Colorado; thus they settled for the smallest allocation of all the states in the Colorado River Compact. Through the early decades of the 20th century, the Upper Basin states, with the exception of Colorado, remained relatively undeveloped and used little of the water allowed to them under the Colorado River Compact. Water use had increased significantly by the 1950s, and more water was being diverted out of the Colorado River basin to the Front Range corridor, the Salt Lake City area in Utah, and the Rio Grande basin in New Mexico. Such projects included the Roberts Tunnel, completed in 1956, which diverts 63,000 acre feet (78,000 ML) per year from the Blue River to the city of Denver, and the Fryingpan-Arkansas Project, which delivers 69,200 acre feet (85,400 ML) from the Fryingpan River to the Arkansas River basin each year. Without the addition of surface water storage in the upper basin, there was no guarantee that the upper basin states would be able to use the full amount of water given to them by the compact. There was also the concern that drought could impair the upper basin's ability to deliver the required 7.5 million acre feet (9.3×109 m3) past Lee's Ferry per year as stipulated by the compact. A 1956 act of Congress cleared the way for the USBR's Colorado River Storage Project (CRSP), which entailed the construction of large dams on the Colorado, Green, Gunnison and San Juan Rivers. The initial blueprints for the CRSP included two dams on the Green River within Dinosaur National Monument's Echo Park Canyon, a move criticized by both the U.S. National Park Service and environmentalist groups such as the Sierra Club. Controversy reached a nationwide scale, and the USBR dropped its plans for the Dinosaur dams in exchange for a dam at Flaming Gorge and a raise to an already-proposed dam at Glen Canyon. The famed opposition to Glen Canyon Dam, the primary feature of the CRSP, did not build momentum until construction was well underway. This was primarily because of Glen Canyon's remote location and the result that most of the American public did not even know of the existence of the impressive gorge; the few who did contended that it had much greater scenic value than Echo Park. Sierra Club leader David Brower fought the dam both during the construction and for many years afterwards until his death in 2000. Brower strongly believed that he was personally responsible for the failure to prevent Glen Canyon's flooding, calling it his "greatest mistake, greatest sin". Agricultural and urban growth in Arizona eventually outstripped the capacity of local rivers; these concerns were reflected in the creation of a Pacific Southwest Water Plan in the 1950s, which aimed to build a project that would permit Arizona to fully utilize its 2.8-million-acre-foot (3.5 km3) allotment of the river. The Pacific Southwest Water Plan was the first major proposal to divert water to the Colorado Basin from other river basins – namely, from the wetter northwestern United States. It was intended to boost supplies for the Lower Basin states of Arizona, California and Nevada as well as Mexico, thus allowing the Upper Basin states to retain native Colorado River flows for their own use. Although there was still a surplus of water in the Colorado Basin during the mid-20th century, the Bureau of Reclamation predicted, correctly, that eventually population growth would outstrip the available supply and require the transfer of water from other sources. The original version of the plan proposed to divert water from the Trinity River in northern California to reduce Southern California's dependence on the Colorado, allowing more water to be pumped, by exchange, to central Arizona. Because of the large amount of power that would be required to pump Colorado River water to Arizona, the CAP originally included provisions for hydroelectric dams at Bridge Canyon and Marble Canyon, which would have flooded large portions of the Colorado within the Grand Canyon and dewatered much of the remainder. When these plans were publicized, the environmental movement – still reeling from the Glen Canyon controversy – successfully lobbied against the project. As a result, the Grand Canyon dams were removed from the CAP agenda, the boundaries of Grand Canyon National Park were extended to preclude any further development in the area, and the pumping power was replaced by the building of the coal-fired Navajo Generating Station near Page, Arizona, in 1976. The resulting Central Arizona Project (CAP) irrigates more than 830,000 acres (3,400 km2) and provides municipal supplies to over 5 million people from Phoenix to Tucson using water from the Colorado River. The Colorado was named for the reddish color caused by its natural sediment loads, but damming the river has caused it to acquire a clear green hue as seen here in lower Glen Canyon. 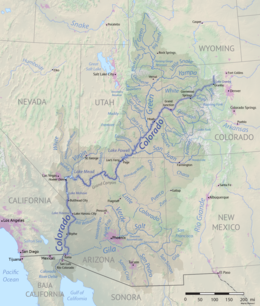 Historically, the Colorado transported from 85 to 100 million short tons (77,000,000 to 91,000,000 t) of sediment or silt to the Gulf of California each year – second only to the Mississippi among North American rivers. 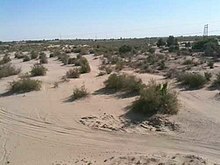 This sediment nourished wetlands and riparian areas along the river's lower course, particularly in its 3,000-square-mile (7,800 km2) delta, once the largest desert estuary on the continent. Currently, the majority of sediments carried by the Colorado River are deposited at the upper end of Lake Powell, and most of the remainder ends up in Lake Mead. Various estimates place the time it would take for Powell to completely fill with silt at 300 to 700 years. Dams trapping sediment not only pose damage to river habitat but also threaten future operations of the Colorado River reservoir system. Reduction in flow caused by dams, diversions, water for thermoelectric power stations, and evaporation losses from reservoirs – the latter of which consumes more than 15 percent of the river's natural runoff – has had severe ecological consequences in the Colorado River Delta and the Gulf of California. Historically, the delta with its large freshwater outflow and extensive salt marshes provided an important breeding ground for aquatic species in the Gulf. Today's desiccated delta, at only a fraction of its former size, no longer provides suitable habitat, and populations of fish, shrimp and sea mammals in the gulf have seen a dramatic decline. Since 1963, the only times when the Colorado River has reached the ocean have been during El Niño events in the 1980s and 1990s. Reduced flows have led to increases in the concentration of certain substances in the lower river that have impacted water quality. Salinity is one of the major issues and also leads to the corrosion of pipelines in agricultural and urban areas. The lower Colorado's salt content was about 50 parts per million (ppm) in its natural state, but by the 1960s, it had increased to well over 2000 ppm. By the early 1970s, there was also serious concern about salinity caused by salts leached from local soils by irrigation drainage water, which were estimated to add 10 million short tons (9,100,000 t) of excess salt to the river per year. The Colorado River Basin Salinity Control Act was passed in 1974, mandating conservation practices including the reduction of saline drainage. The program reduced the annual load by about 1.2 million short tons (1,100,000 t), but salinity remains an ongoing issue. In 1997, the USBR estimated that saline irrigation water caused crop damages exceeding $500 million in the U.S. and $100 million in Mexico. Further efforts have been made to combat the salt issue in the lower Colorado, including the construction of a desalination plant at Yuma. In 2011, the seven U.S. states agreed upon a "Plan of Implementation", which aims to reduce salinity by 644,000 short tons (584,000 t) per year by 2030. In 2013, the Bureau of Reclamation estimated that around $32 million was spent each year to prevent around 1.2 million tons of salt from entering and damaging the Colorado River. Agricultural runoff containing pesticide residues has also been concentrated in the lower river in greater amounts. This has led to fish kills; six of these events were recorded between 1964 and 1968 alone. The pesticide issue is even greater in streams and water bodies near agricultural lands irrigated by the Imperial Irrigation District with Colorado River water. 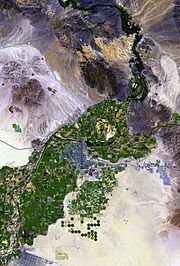 In the Imperial Valley, Colorado River water used for irrigation overflows into the New and Alamo rivers and into the Salton Sea. Both rivers and the sea are among the most polluted bodies of water in the United States, posing dangers not only to aquatic life but to contact by humans and migrating birds. Pollution from agricultural runoff is not limited to the lower river; the issue is also significant in upstream reaches such as Colorado's Grand Valley, also a major center of irrigated agriculture. Large dams such as Hoover and Glen Canyon typically release water from lower levels of their reservoirs, resulting in stable and relatively cold year-round temperatures in long reaches of the river. The Colorado's average temperature once ranged from 85 °F (29 °C) at the height of summer to near freezing in winter, but modern flows through the Grand Canyon, for example, rarely deviate significantly from 46 °F (8 °C). Changes in temperature regime have caused declines of native fish populations, and stable flows have enabled increased vegetation growth, obstructing riverside habitat. These flow patterns have also made the Colorado more dangerous to recreational boaters; people are more likely to die of hypothermia in the colder water, and the general lack of flooding allows rockslides to build up, making the river more difficult to navigate. In the 21st century, there has been renewed interest in restoring a limited water flow to the delta. In November 2012, the U.S. and Mexico reached an agreement, known as Minute 319, permitting Mexico storage of its water allotment in U.S. reservoirs during wet years, thus increasing the efficiency with which the water can be used. In addition to renovating irrigation canals in the Mexicali Valley to reduce leakage, this will make about 45,000 acre feet (56,000,000 m3) per year available for release to the delta on average. The water will be used to provide both an annual base flow and a spring "pulse flow" to mimic the river's original snowmelt-driven regime. The first pulse flow, an eight-week release of 105,000 acre feet (130,000,000 m3), was initiated on March 21, 2014, with the aim of revitalising 2,350 acres (950 hectares) of wetland. This pulse reached the sea on May 16, 2014, marking the first time in 16 years that any water from the Colorado flowed into the ocean, and was hailed as "an experiment of historic political and ecological significance" and a landmark in U.S.–Mexican cooperation in conservation. The pulse will be followed by the steady release of 52,000 acre feet (64,000,000 m3) over the following three years, just a small fraction of its average flow before damming. When the Colorado River Compact was drafted in the 1920s, it was based on barely 30 years of streamflow records that suggested an average annual flow of 17.5 million acre feet (21.6 km3) past Lee's Ferry. Modern studies of tree rings revealed that those three decades were probably the wettest in the past 500 to 1,200 years and that the natural long-term annual flow past Lee's Ferry is probably closer to 13.5 million acre feet (16.7 km3),[n 9] as compared to the natural flow at the mouth of 16.3 million acre feet (20.1 km3). This has resulted in more water being allocated to river users than actually flows through the Colorado. Droughts have exacerbated the issue of water over-allocation, including the Texas drought of the 1950s, which saw several consecutive years of notably low water and has often been used in planning for "a worst-case scenario". The most severe drought on record began in the early 21st century, in which the river basin produced normal or above-average runoff in only four years between 2000 and 2012. Major reservoirs in the basin dropped to historic lows, with Lake Powell falling to just one-third of capacity in early 2005, the lowest level on record since 1969, when the reservoir was still in the process of filling. The watershed is experiencing a warming trend, which is accompanied by earlier snowmelt and a general reduction in precipitation. A 2004 study showed that a 1–6 percent decrease of precipitation would lead to runoff declining by as much as 18 percent by 2050. Average reservoir storage declined by at least 32 percent, further crippling the region's water supply and hydropower generation. A study by the Scripps Institution of Oceanography in 2008 predicted that both Lake Mead and Lake Powell stand an even chance of dropping to useless levels or "dead pool"[n 10] by 2021 if current drying trends and water usage rates continue. In late 2010, Lake Mead dropped to just 8 feet (2.4 m) above the first "drought trigger" elevation, a level at which Arizona and Nevada would have to begin rationing water as delineated by the Colorado River Compact. Despite above-average runoff in 2011 that raised the immense reservoir more than 30 feet (9.1 m), record drought conditions returned in 2012 and 2013. Reservoir levels were low enough at the beginning of water year 2014 that the Bureau of Reclamation cut releases from Lake Powell by 750,000 acre feet (930,000,000 m3) – the first such reduction since the 1960s, when Lake Powell was being filled for the first time. This resulted in Lake Mead dropping to its lowest recorded level since 1937, when it was first being filled. Rapid development and economic growth further complicate the issue of a secure water supply, particularly in the case of California's senior water rights over those of Nevada and Arizona: in case of a reduction in water supply, Nevada and Arizona would have to endure severe cuts before any reduction in the California allocation, which is also larger than the other two combined. Although stringent water conservation measures have been implemented, the threat of severe shortfalls in the Colorado River basin continues to increase each year. After a much lower-than-average snowpack in the 2018 water year, Bureau of Reclamation officials projected the odds of an official shortage declaration in 2020 at 52 percent, in 2021 at 64 percent, and in 2022 at 68 percent. The Colorado River and its tributaries often nourish extensive corridors of riparian growth as they traverse the arid desert regions of the watershed. Although riparian zones represent a relatively small proportion of the basin and have been affected by engineering projects and river diversion in many places, they have the greatest biodiversity of any habitat in the basin. The most prominent riparian zones along the river occur along the lower Colorado below Davis Dam, especially in the Colorado River Delta, where riparian areas support 358 species of birds despite the reduction in freshwater flow and invasive plants such as tamarisk (salt cedar). Reduction of the delta's size has also threatened animals such as jaguars and the vaquita porpoise, which is endemic to the gulf. Human development of the Colorado River has also helped to create new riparian zones by smoothing the river's seasonal flow, notably through the Grand Canyon. More than 1,600 species of plants grow in the Colorado River watershed, ranging from the creosote bush, saguaro cactus, and Joshua trees of the Sonoran and Mojave Deserts to the forests of the Rocky Mountains and other uplands, composed mainly of ponderosa pine, subalpine fir, Douglas-fir and Engelmann spruce. Before logging in the 19th century, forests were abundant in high elevations as far south as the Mexico–U.S. border, and runoff from these areas nourished abundant grassland communities in river valleys. Some arid regions of the watershed, such as the upper Green River valley in Wyoming, Canyonlands National Park in Utah and the San Pedro River valley in Arizona and Sonora, supported extensive reaches of grassland roamed by large mammals such as buffalo and antelope as late as the 1860s. Near Tucson, Arizona, "where now there is only powder-dry desert, the grass once reached as high as the head of a man on horse back". Rivers and streams in the Colorado basin were once home to 49 species of native fish, of which 42 were endemic. Engineering projects and river regulation have led to the extinction of four species and severe declines in the populations of 40 species. Bonytail chub, razorback sucker, Colorado pikeminnow, and humpback chub are among those considered the most at risk; all are unique to the Colorado River system and well adapted to the river's natural silty conditions and flow variations. Clear, cold water released by dams has significantly changed characteristics of habitat for these and other Colorado River basin fishes. A further 40 species that occur in the river today, notably the brown trout, were introduced during the 19th and 20th centuries, mainly for sport fishing. Famed for its dramatic rapids and canyons, the Colorado is one of the most desirable whitewater rivers in the United States, and its Grand Canyon section – run by more than 22,000 people annually – has been called the "granddaddy of rafting trips". Grand Canyon trips typically begin at Lee's Ferry and take out at Diamond Creek or Lake Mead; they range from one to eighteen days for commercial trips and from two to twenty-five days for private trips. Private (noncommercial) trips are extremely difficult to arrange because the National Park Service limits river traffic for environmental purposes; people who desire such a trip often have to wait more than 10 years for the opportunity. Several other sections of the river and its tributaries are popular whitewater runs, and many of these are also served by commercial outfitters. The Colorado's Cataract Canyon and many reaches in the Colorado headwaters are even more heavily used than the Grand Canyon, and about 60,000 boaters run a single 4.5-mile (7.2 km) section above Radium, Colorado, each year. 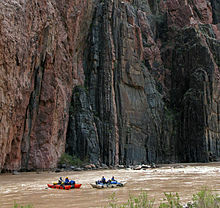 The upper Colorado also includes many of the river's most challenging rapids, including those in Gore Canyon, which is considered so dangerous that "boating is not recommended". Another section of the river above Moab, known as the Colorado "Daily" or "Fisher Towers Section", is the most visited whitewater run in Utah, with more than 77,000 visitors in 2011 alone. The rapids of the Green River's Gray and Desolation Canyons and the less difficult "Goosenecks" section of the lower San Juan River are also frequently traversed by boaters. Eleven U.S. national parks – Arches, Black Canyon of the Gunnison, Bryce Canyon, Canyonlands, Capitol Reef, Grand Canyon, Mesa Verde, Petrified Forest, Rocky Mountain, Saguaro, and Zion – are in the watershed, in addition to many national forests, state parks, and recreation areas. Hiking, backpacking, camping, skiing, and fishing are among the multiple recreation opportunities offered by these areas. 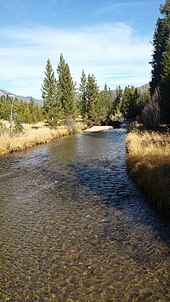 Fisheries have declined in many streams in the watershed, especially in the Rocky Mountains, because of polluted runoff from mining and agricultural activities. The Colorado's major reservoirs are also heavily traveled summer destinations. Houseboating and water-skiing are popular activities on Lakes Mead, Powell, Havasu, and Mojave, as well as Flaming Gorge Reservoir in Utah and Wyoming, and Navajo Reservoir in New Mexico and Colorado. Lake Powell and surrounding Glen Canyon National Recreation Area received more than two million visitors per year in 2007, while nearly 7.9 million people visited Lake Mead and the Lake Mead National Recreation Area in 2008. Colorado River recreation employs some 250,000 people and contributes $26 billion each year to the Southwest economy. ^ Discharge data is for Green River, Utah, 117.6 miles (189.3 km) upstream from the mouth. The stream gauge here measures flow from an area of 44,850 square miles (116,200 km2), representing about 93.2 percent of the basin. ^ Before large irrigation and municipal diversions, the Gila River discharged about 1.3 million acre feet (1.6×109 m3) per year, equating a flow of nearly 2,000 cubic feet per second (57 m3/s). ^ Discharge data is for Bluff, Utah, located about 113.5 miles (182.7 km) above the confluence with the Colorado. The gauge measures flow from an area of 23,000 square miles (60,000 km2), about 93.5 percent of the basin. ^ Discharge data is for Littlefield, Arizona, about 66 miles (106 km) from the confluence with the Colorado, and also upstream of the confluence with its major tributary, the Muddy River. The gauge measures flow from an area of 5,090 square miles (13,200 km2), about 39.1 percent of the total basin. ^ NIB = "Northerly International Boundary", or the point at which the Colorado begins to form the Mexico–U.S. border, south of Yuma. Also note that the SIB ("Southerly International Boundary") is the point at which the Colorado ceases to form the border and passes entirely into Mexico. ^ American population (9.7 million) calculated from statistics from the U.S. Census Bureau and the State of Colorado. The population in Mexico is about 3 million. ^ The average discharge of the Colorado (Grand) River at Cisco, Utah, about 97 miles (156 km) upstream from the Green River confluence, is 7,181 cubic feet per second (203.3 m3/s); between here and the confluence, only a few small, intermittent tributaries join the river. The Green River has an average discharge of 6,048 cubic feet per second (171.3 m3/s) as measured at Green River, Utah, about 117.6 miles (189.3 km) above the confluence; below here the only major tributary is the San Rafael River, which contributes an average of 131 cubic feet per second (3.7 m3/s), resulting in a total of 6,169 cubic feet per second (174.7 m3/s), still significantly lower than the discharge of the Colorado at their confluence. ^ The discrepancy between the natural flow at Lee's Ferry (13.5 million acre-feet/16.65 km3) and the gauged flow between 1921 and 2010 (10.7 million acre-feet/13.22 km3) is mostly due to water diversions above Lee's Ferry and evaporation from reservoirs, especially Lake Powell. ^ Dead pool refers to the lowest lake level at which water can be released through the dam. For example, Lake Mead's "dead" capacity is about 2 million acre feet (2.5 km3). ^ a b "Colorado River". Geographic Names Information System. United States Geological Survey. February 8, 1980. Retrieved February 18, 2012. ^ a b c d Kammerer, J.C. (May 1990). "Largest Rivers in the United States". U.S. Geological Survey. Retrieved July 2, 2010. ^ a b c d Nowak, Kenneth C. (April 2, 2012). "Stochastic Streamflow Simulation at Interdecadal Time Scales and Implications to Water Resources Management in the Colorado River Basin" (PDF). Center for Advanced Decision Support for Water and Environmental Systems. University of Colorado. p. 114. Archived from the original (PDF) on May 1, 2014. Retrieved July 11, 2013. ^ a b "USGS Gage #09424000 on the Colorado River near Topock, AZ – Daily Data". National Water Information System. U.S. Geological Survey. February 14, 1935. Retrieved April 21, 2012. ^ a b Wiltshire, Gilbert & Rogers 2010, p. 102. ^ "The Compact and Lees Ferry". Colorado River Streamflow: A Paleo Perspective. Western Water Assessment. Archived from the original on April 29, 2012. ^ a b Waterman, Jonathan (February 15, 2012). "Where the Colorado Runs Dry". The New York Times. Retrieved October 14, 2014. ^ a b "Imperial Valley". Encyclopædia Britannica. 1995. ^ Diaz, Henry F.; Anderson, Craig A. (November 28, 2003). "Precipitation Trends and Water Consumption in the Southwestern United States". Impact of Climate Change and Land Use in the Southwestern United States. U.S. Geological Survey. Archived from the original on March 9, 2012. ^ a b Postel, Sandra (May 19, 2014). "A Sacred Reunion: The Colorado River Returns to the Sea". National Geographic. Retrieved May 19, 2014. ^ "La Poudre Pass". Geographic Names Information System. United States Geological Survey. October 13, 1978. Retrieved March 12, 2012. ^ Lindberg 2009, p. 38. ^ Benke & Cushing 2005, p. 490. ^ a b Pitlick, John; Cress, Robert (March 2000). "Longitudinal Trends in Channel Characteristics of the Colorado River and Implications for Food-Web Dynamics" (PDF). University of Colorado. Archived from the original (PDF) on June 3, 2012. Retrieved March 12, 2012. ^ U.S. Geological Survey. "United States Geological Survey Topographic Maps: Fall River Pass, Colorado quad". TopoQuest. Retrieved June 24, 2013. ^ U.S. Geological Survey. "United States Geological Survey Topographic Maps: Westwater, Utah quad". TopoQuest. Retrieved July 14, 2013. ^ "Affected Environment" (PDF). Remediation of the Moab Uranium Mill Tailings, Grand and San Juan Counties, Utah Final Environmental Impact Statement. Moab, Utah, UMTRA Project. p. 28. Archived from the original (PDF) on October 15, 2011. ^ Rigby, J. Keith; Hamblin, W. Kenneth; Matheny, Ray; Welsh, Stanley L. (1971). "Guidebook to the Colorado River Part 3: Moab to Hite, Utah through Canyonlands National Park" (PDF). Brigham Young University Geology Studies Volume 18 – Part 2. Brigham Young University. Archived from the original (PDF) on April 2, 2015. Retrieved July 14, 2013. ^ Hopkins 2002, p. 118. ^ Van Cott 1990, p. 70. ^ Van Cott 1990, p. 155. ^ "Rivers". Canyonlands National Park. U.S. National Park Service. June 17, 2011. Retrieved February 19, 2012. ^ "Lake Powell". Colorado River Storage Project. U.S. Bureau of Reclamation. November 4, 2008. Archived from the original on June 3, 2012. Retrieved February 19, 2012. ^ Rusho, W.L. (1992). "Lee's Ferry, Arizona". Utah History Encyclopedia. University of Utah. Archived from the original on January 9, 2013. Retrieved February 19, 2012. ^ "Grand Canyon National Park, Arizona: Geology Fieldnotes". U.S. National Park Service. Retrieved July 14, 2013. ^ Leopold, Luna B. "The Rapids and the Pools – Grand Canyon" (PDF). Geological Survey Professional Paper 669–D. U.S. Geological Survey. p. 133. Retrieved November 2, 2013. ^ a b "Hoover Dam Frequently Asked Questions and Answers: Lake Mead". U.S. Bureau of Reclamation. December 2008. Archived from the original on June 3, 2012. Retrieved February 19, 2012. ^ "Hoover Dam Bypass Is 2012 OCEA Winner; OPAL Lifetime Achievement Recipients Honored; Pankow, Michel Awards Presented". American Society of Civil Engineers. Archived from the original on March 27, 2013. Retrieved July 14, 2013. ^ "The Colorado River Indian Tribes Reservation (C.R.I.T.) Quick Facts" (PDF). Arizona Cooperative Extension. University of Arizona. August 2010. Retrieved July 14, 2013. ^ "Appendix J: Mainstem Impacts Analysis" (PDF). Draft Environmental Impact Statement: Allocation of Water Supply and Long-Term Contract Execution, Central Arizona Project. U.S. Bureau of Reclamation. Archived from the original (PDF) on January 20, 2013. Retrieved April 4, 2012. ^ U.S. Geological Survey. "United States Geological Survey Topographic Maps: Blythe NE, California quad". TopoQuest. Retrieved July 14, 2013. ^ Gupta 2007, p. 204. ^ Alles, David L., ed. (October 28, 2011). "The Lower Colorado River" (PDF). Biology Department. Western Washington University. Retrieved July 14, 2013. ^ "Fighting For Water In Arid Imperial Valley". National Public Radio. February 10, 2011. Retrieved February 19, 2012. ^ "Border Water Source of Conflict and Cooperation: What Makes Management of Border Water Resources a Challenge?" (PDF). Arroyo. University of Arizona. 2012. Retrieved July 14, 2013. ^ Valdes-Casillas, Carlos; et al. (August 1998). "Information Database and Local Outreach Program for the Restoration of the Hardy River Wetlands, Lower Colorado River Delta, Baja California and Sonora, Mexico". San Diego State University. Retrieved February 19, 2012. ^ Chanson, Hubert (2009). Environmental, Ecological and Cultural Impacts of Tidal Bores, Benaks, Bonos and Burros. Proceedings of the International Workshop on Environmental Hydraulics IWEH09, Theoretical, Experimental and Computational Solutions. University of Queensland. ^ Felger & Broyles 2007, pp. 519–520. ^ "Executive Summary, Green River Basin Water Plan". Wyoming State Water Plan. February 2001. Archived from the original on November 25, 2011. Retrieved February 25, 2012. ^ a b c d e f g h i "Boundary Descriptions and Names of Regions, Subregions, Accounting Units and Cataloging Units". U.S. Geological Survey. Retrieved February 19, 2012. ^ a b Benke & Cushing 2005, p. 514. ^ Benke & Cushing 2005, pp. 532–533. ^ "Green River". Utah Rivers Council. Archived from the original on June 26, 2012. Retrieved February 26, 2012. ^ a b c "USGS Gage #09315000 on the Green River at Green River, UT" (PDF). National Water Information System. U.S. Geological Survey. 1895–2010. Retrieved February 26, 2012. ^ "USGS Gage #09520000 on the Gila River near Dome, AZ" (PDF). National Water Information System. U.S. Geological Survey. 1905–2011. Retrieved February 26, 2012. ^ a b "USGS Gage #09379000 on the San Juan River near Bluff, UT" (PDF). National Water Information System. U.S. Geological Survey. 1914–2010. Retrieved February 26, 2012. ^ "Report, Findings, and Determination Regarding the Navigability of the Little Colorado River From its Headwaters to the Confluence with the Colorado River" (PDF). Arizona Navigable Stream Adjudication Commission. 2005. Archived from the original (PDF) on April 22, 2010. Retrieved February 26, 2012. ^ "USGS Gage #09402300 on the Little Colorado River Above the Mouth near Desert View, AZ" (PDF). National Water Information System. U.S Geological Survey. 1990–2010. Retrieved February 26, 2012. ^ Fielder 2002, p. 403. ^ "USGS Gage #09180000 on the Dolores River near Cisco, UT" (PDF). National Water Information System. U.S. Geological Survey. 1950–2010. Retrieved February 26, 2012. ^ "USGS Gage #09152000 on the Gunnison River near Grand Junction, CO" (PDF). National Water Information System. U.S. Geological Survey. 1897–2010. Retrieved February 26, 2012. ^ Annerino 1999, p. 8. ^ a b "USGS Gage #09415000 on the Virgin River at Littlefield, AZ" (PDF). National Water Information System. U.S. Geological Survey. 1929–2010. Retrieved February 26, 2012. ^ a b Wiltshire, Gilbert & Rogers 2010, pp. 101–102. ^ Leopold 1994, p. 267. ^ National Research Council (U.S.), Committee to Review the Glen Canyon Environmental Studies 1996, p. 51. ^ "USGS Gage #09421500 on the Colorado River below Hoover Dam". National Water Information System. U.S. Geological Survey. 1934–2011. Retrieved October 19, 2012. ^ a b c d "Climatic Fluctuations, Drought, and Flow in the Colorado River Basin". USGS Fact Sheet 2004-3062. U.S. Geological Survey. August 2004. Retrieved April 17, 2012. ^ a b c Benke & Cushing 2005, p. 488. ^ Preston, Ben (March 22, 2010). "The Risky Business of Slicing the Pie". Miller–McCune. Retrieved June 27, 2013. ^ Wahl, Kenneth L.; Collins, Dannie L.; Aldridge, Byron N. "Runoff in the Upper Colorado River Basin Water Years, 1983–85, and Comparisons with Forecasts of Runoff to Lake Powell" (PDF). Western Snow Conference. Archived from the original (PDF) on July 14, 2012. ^ Cohen, Michael J.; Henges-Jeck, Christine; Castillo-Moreno, Gerardo (2001). "A Preliminary Water Balance for the Colorado River Delta, 1992–1998" (PDF). Journal of Arid Environments. 49 (1): 35–48. Bibcode:2001JArEn..49...35C. doi:10.1006/jare.2001.0834. Retrieved June 27, 2013. ^ Zimmerman, Janet (October 6, 2010). "Colorado River Drought Threatens Power Production". The Press-Enterprise. Riverside, California. Archived from the original on January 20, 2013. Retrieved February 18, 2012. ^ Stark, Mike (April 21, 2009). "Study: Shortages Likely on Colorado River by 2050". USA Today. Associated Press. Retrieved June 27, 2013. ^ Hoerling, Martin; Eischeid, Jon. "Past Peak Water in the Southwest" (PDF). Western Water Assessment. Archived from the original (PDF) on June 9, 2010. ^ McKinnon, Shaun (August 9, 2006). "Mines, Farms Put Gila River on Life Support: Despite Lack of Regulation, Some Trying to Restore River to Its Natural Beauty and Wonder". Arizona Republic. Retrieved February 19, 2012. ^ a b "USGS Gage #09522000 on the Colorado River at Northerly International Boundary, Above Morelos Dam, Near Andrade, CA" (PDF). National Water Information System. U.S. Geological Survey. 1950–2010. Retrieved February 26, 2012. ^ "Reclamation". Colorado River Water Users Association. Retrieved November 2, 2013. ^ Christensen, Niklas S.; Wood, Andrew W.; Voisin, Nathalie; Lettenmaier, Dennis P.; Palmer, Richard N. (2004). "The Effects of Climate Change on the Hydrology and Water Resources of the Colorado River Basin" (PDF). Climatic Change. 62 (337–363): 345. doi:10.1023/b:clim.0000013684.13621.1f. Retrieved July 13, 2013. ^ "USGS Gage #09522200 on the Colorado River at NIB, Above Morelos Dam, AZ – Annual Statistics". National Water Information System. U.S. Geological Survey. 1951–1992. Retrieved April 27, 2012. ^ "USGS Gage #09010500 on the Colorado River below Baker Gulch near Grand Lake, CO" (PDF). National Water Information System. U.S. Geological Survey. 1953–2010. Retrieved February 26, 2012. ^ "USGS Gage #09070500 on the Colorado River near Dotsero, CO" (PDF). National Water Information System. U.S. Geological Survey. 1941–2011. Retrieved February 26, 2012. ^ a b "USGS Gage #09180500 on the Colorado River near Cisco, UT" (PDF). National Water Information System. U.S. Geological Survey. 1895–2010. Retrieved February 26, 2012. ^ a b c "USGS Gage #09380000 on the Colorado River at Lees Ferry, AZ" (PDF). National Water Information System. U.S. Geological Survey. 1895–2010. Retrieved February 18, 2012. ^ "USGS Gage #09423000 on the Colorado River below Davis Dam, AZ–NV" (PDF). National Water Information System. U.S. Geological Survey. 1905–2010. Retrieved February 26, 2012. ^ "USGS Gage #09427520 on the Colorado River Below Parker Dam, AZ–CA" (PDF). National Water Information System. U.S. Geological Survey. 1935–2010. Retrieved February 26, 2012. ^ "USGS Gage #09429600 on the Colorado River Below Laguna Dam, AZ–CA" (PDF). National Water Information System. U.S. Geological Survey. 1971–2010. Retrieved February 26, 2012. ^ "USGS Surface-Water Annual Statistics for USA Grouped by Hydrologic Unit". National Water Information System. U.S. Geological Survey. Retrieved February 26, 2012. ^ a b "USGS Gage #09380000 on the Colorado River at Lee's Ferry, AZ". National Water Information System. U.S. Geological Survey. 1921–2010. Retrieved April 21, 2012. ^ Benke & Cushing 2005, pp. 483–489. ^ Baker Jr., Malchus B.; Ffolliott, Peter F. (2000). "Contributions of Watershed Management Research to Ecosystem-Based Management in the Colorado River Basin" (PDF). USDA Forest Service Proceedings RMRS–P–13. U.S. Forest Service. Retrieved June 24, 2013. ^ Benke & Cushing 2005, pp. 483–485. ^ Fassnacht, S.R. (2004). "Streamflow Predictability in the Upper Versus Lower Colorado River Sub-Basins" (PDF). Eastern Snow Conference. Archived from the original (PDF) on June 3, 2012. Retrieved February 19, 2012. ^ Features and Dynamics of Colorado River Basin Climate. Colorado River Basin Water Management: Evaluating and Adjusting to Hydroclimatic Variability. National Academies Press. 2007. doi:10.17226/11857. ISBN 978-0-309-10524-8. Retrieved February 19, 2012. ^ "State and County QuickFacts". U.S. Census Bureau. Archived from the original on March 4, 2012. Retrieved March 4, 2012. ^ a b "Population and Demographics". Colorado Data Book. State of Colorado. September 2007. Archived from the original (PDF) on January 20, 2013. ^ "Colorado River Basin Salinity Control Program". Natural Resources Conservation Service. U.S. Department of Agriculture. July 12, 2010. Retrieved March 4, 2012. ^ "Colorado River Basin Water Management: Evaluating and Adjusting to Hydroclimatic Variability (Report in Brief)" (PDF). Division on Earth & Life Studies. National Academies. February 2007. Retrieved February 19, 2012. ^ a b c "Watersheds (map)". Commission for Environmental Cooperation. 2006. Archived from the original on April 14, 2008. 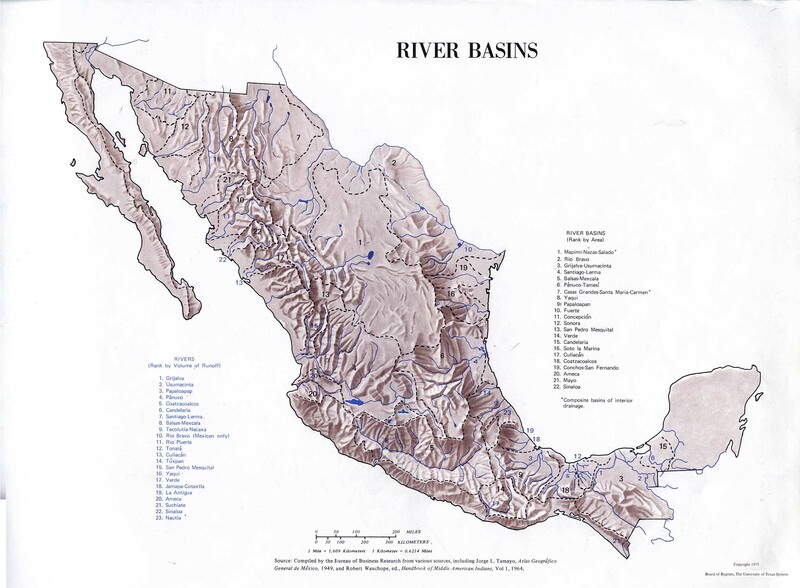 ^ "River Basins of Mexico". University of Texas. 1975. Archived from the original on November 7, 2011. Retrieved February 19, 2012. ^ Prisciantelli 2002, p. 56. ^ Cannon, Eric (April 28, 2002). "The Mid-Tertiary Ignimbrite Flare-Up". University of Colorado, Boulder. Archived from the original on June 3, 2012. Retrieved February 19, 2012. ^ Foos, Annabelle. "Geology of the Colorado Plateau" (PDF). U.S. National Park Service. Retrieved February 19, 2012. ^ Martin-Barajas, Arturo; et al. (July 2009). "The Tectonic Evolution of the Gulf of California". Division of Geological and Planetary Sciences. California Institute of Technology. Retrieved February 19, 2012. ^ Young & Spamer 2001, p. 193. ^ Davis, Jim (January 2009). "Why Does a River Run Through It?". Survey Notes. Utah Geological Survey. 41 (1). Retrieved February 19, 2012. ^ Prisciantelli 2002, p. 62. ^ Alles, David L., ed. (October 28, 2011). "Geology of the Salton Trough" (PDF). Western Washington University. Retrieved February 29, 2012. ^ Buckles, Joseph E.; Krantz, Timothy. "Reconstruction of Prehistoric Shorelines for Cultural Restraints using GIS". Salton Sea Database Program. ESRI. Archived from the original on November 27, 2011. Retrieved February 19, 2012. ^ Fenton, Cassie; Webb, Bob. "A Fresh Look at Western Grand Canyon Lava Dams: Introduction". Grand Canyon River Guides. Retrieved February 19, 2012. ^ Rugg, Scott H.; Austin, Steven A. (August 1998). "Evidence for Rapid Formation and Failure of Pleistocene "Lava Dams" of the Western Grand Canyon, Arizona" (PDF). Institute for Creation Research. Archived from the original (PDF) on June 3, 2012. Retrieved February 19, 2012. ^ Fenton, Cassandra R.; Poreda, Robert J.; Nash, Barbara P.; Webb, Robert H.; Cerling, Thure E.; et al. (2004). "Geochemical Discrimination of Five Pleistocene Lava-Dam Outburst-Flood Deposits, Western Grand Canyon, Arizona" (PDF). Journal of Geology. 112 (1): 91–110. Bibcode:2004JG....112...91F. doi:10.1086/379694. Retrieved February 19, 2012. ^ Fenton, Cassandra R.; Webb, Robert H; Cerling, Thure E. (May 6, 2005). "Peak Discharge of a Pleistocene Lava-Dam Outburst Flood in Grand Canyon, Arizona, USA" (PDF). U.S. Geological Survey. Archived from the original (PDF) on October 15, 2011. Retrieved February 19, 2012. ^ a b c d "People of the Colorado Plateau". Land Use History of North America. Northern Arizona University. Archived from the original on June 29, 2015. Retrieved April 9, 2012. ^ "Formative Era/Fremont Culture". U.S. Bureau of Land Management. August 31, 2009. Archived from the original on June 23, 2012. Retrieved April 9, 2012. ^ "Fremont Culture". Dinosaur National Monument. U.S. National Park Service. Retrieved April 9, 2012. ^ Vess, Deborah. "The Anasazi". Georgia College and State University. Archived from the original on June 8, 2011. ^ "Water Development, Extraction, and Diversion". Land Use History of North America: Colorado Plateau. Northern Arizona University. p. 2. Archived from the original on February 14, 2015. Retrieved October 21, 2014. ^ Fisher, Richard D. "Ancient Knowledge of the Chaco Canyon Anasazi" (PDF). Grand Canyons of the Earth. Archived from the original (PDF) on May 12, 2013. ^ "History & Culture". Chaco Culture National Historic Park. U.S. National Park Service. Retrieved April 9, 2012. ^ "Pueblo Bonito". Evaluating Models of Chaco: A Virtual Conference. University of Colorado Boulder. Archived from the original on June 3, 2012. Retrieved April 9, 2012. ^ Howard, Jerry B. "Hohokam Legacy: Desert Canals". Pueblo Grande Museum Profiles No. 12. WaterHistory.org. Retrieved April 9, 2012. ^ Nobles 1998, p. 26. ^ Logan 2006, pp. 21–22. ^ a b "Ancient Forest Management in the Chaco Canyon – From 600 AD to 1300 AD". Tenthmil. Archived from the original on December 24, 2010. ^ Andrews, John P.; Bostwick, Todd W. "Desert Farmers at the River's Edge: The Hohokam and Pueblo Grande". Pueblo Grande Museum Archaeological Park. City of Phoenix. Archived from the original on May 8, 2012. Retrieved April 10, 2012. ^ Antone, Caroline. Piipayk m'iim. Salt River: Oʼodham Piipaash Language Program, 2000. ^ Gupta 2010, p. 362. ^ Hinton, Leanne (1984). A Dictionary of the Havasupai Language. Supai, Arizona: Havasupai Tribe. OCLC 12358778. ^ William Alan Shaterian (1983). "Phonology and Dictionary of Yavapai" (Ph.D. dissertation). University of California, Berkeley. OCLC 13197420. ^ a b "Dine History and Facts". University of California, Irvine: Donald Bren School of Information and Computer Sciences. Archived from the original on December 11, 2012. Retrieved April 10, 2012. ^ "The Navajo: A Brief History" (PDF). The Navajo Nation Division of Economic Development. Retrieved April 10, 2012. ^ "California: Mohave". Southwest Indian Relief Council. Retrieved April 10, 2012. ^ "Ute". Land Use History of North America. Northern Arizona University. Archived from the original on February 5, 2012. Retrieved April 9, 2012. ^ a b Benke & Cushing 2005, p. 486. ^ a b Shaw, Anne Moore. "A Pima Past". Salt River Pima-Maricopa Indian Community. Archived from the original on June 3, 2012. Retrieved April 10, 2012. ^ Pritzker 1998, p. 309. ^ "Navajo Nation". Indian Health Service. Retrieved April 10, 2012. ^ "Treaty Between the United States of America and the Navajo Tribe of Indians". Historic Documents. New Mexico State University. 1868. Archived from the original on March 11, 2002. Retrieved April 10, 2012. ^ "Navajo Nation – Facts at a Glance". The Navajo Nation. 2004. Retrieved April 10, 2012. ^ Kessel & Wooster 2005, p. 217. ^ "Fort Mojave Reservation". Tribal Library Census and Needs Assessment. California State University San Marcos. June 12, 2001. Archived from the original on May 14, 2013. ^ a b "About the Mohave, Chemehuevi, Hopi and Navajo Tribes". Colorado River Indian Tribes. 2009. Retrieved April 10, 2012. ^ "The Colorado River Indian Tribes (C.R.I.T.) Reservation and Extension Programs" (PDF). University of Arizona College of Agriculture and Life Sciences. Indian Country Extension. October 2008. Retrieved April 10, 2012. ^ "Ten Tribes Partnership". Colorado River Water Resources Association. Retrieved November 2, 2013. ^ Voggesser, Garrit (2001). "The Indian Projects" (PDF). Bureau of Reclamation History Program. U.S. Bureau of Reclamation. Archived from the original (PDF) on February 24, 2012. Retrieved April 10, 2012. ^ "Navajo Indian Irrigation Project". U.S. Bureau of Reclamation. May 11, 2011. Archived from the original on September 25, 2012. Retrieved April 10, 2012. ^ Jenkins, Matt (February 21, 2011). "In Navajoland, a Contentious Water Deal Divides the Tribe". High Country News. Paonia, Colorado. Retrieved July 1, 2013. ^ "John Wesley Powell's Exploration of the Colorado River". U.S. Geological Survey. March 28, 2006. Archived from the original on April 5, 2015. Retrieved February 19, 2012. ^ Axelrod & Phillips 2008, p. 4. ^ Lankford 2010, pp. 100–101. ^ Flint, Richard; Flint, Shirley Cushing. "Diaz, Melchior". New Mexico Office of the State Historian. Archived from the original on October 10, 2013. ^ Bolton 2017, pp. 440. ^ Gudde & Bright 2004, p. 50. ^ Dellenbaugh 1909, p. 60. ^ Rolle 1999, p. 54. ^ Executive Documents of the Senate of the United States, No. 37, Report of the Secretary of War, showing the contracts made under the authority of the War Department during the year 1853. ^ Byrd H. Granger (1960). Arizona Place Names. University of Arizona Press. p. 21. Retrieved December 9, 2011. ^ Reports of Explorations and Surveys, to ascertain the most practicable and economical route for a railroad from the Mississippi River to the Pacific Ocean, made under the direction of the Secretary of War, in 1853-4, Volume III, Washington; Government Printing Office: 1856, Report. Explorations for a Railway Route, near the Thirty-Fifth Parallel of North Latitude, from the Mississippi River to the Pacific Ocean: By Lieutenant A. W. Whipple, Corps Of Topographical Engineers Assisted by Lieutenant J. C. Ives, Corps of Topographical Engineers. ^ Joseph C. Ives, REPORT UPON THE COLORADO RIVER OF THE WEST, EXPLORED IN 1857 AND 1858 BY LIEUTENANT JOSEPH C. IVES, CORPS OF TOPOGRAPHICAL ENGINEERS, UNDER THE DIRECTION OP THE OFFICE OF EXPLORATIONS AND SURVEYS, A. A. HUMPHREYS, CAPTAIN TOPOGRAPHICAL ENGINEERS, IN CHARGE. BY ORDER OF THE SECRETARY OF WAR, GOVERNMENT PRINTING OFFICE, WASHINGTON, 1861; PART I. GENERAL REPORT. ^ Dellenbaugh 1909, p. 170. ^ Schmidt 1993, p. 12. ^ Dolnick 2002, p. 5. ^ Leuchtenburg 2000, p. 360. ^ a b Dolnick 2002, p. 238. ^ "Three leave Powell's Grand Canyon expedition". This Day In History. History.com. Retrieved February 20, 2012. ^ "Historic 3D Photographs of the Second Powell Expedition (1871–1872)". Geology of National Parks. U.S. Geological Survey. February 13, 2012. Archived from the original on June 26, 2012. Retrieved February 20, 2012. ^ Warburton, David L. (May 16, 2005). "Geology of National Parks: Glen Canyon National Recreation Area". Florida Atlantic University. Archived from the original on June 7, 2013. ^ Peterson, Richard H. (1979). "Book Review: Steamboats on the Colorado River: 1852–1916". San Diego Historical Society Quarterly. San Diego History Center. Retrieved March 1, 2012. ^ Wildfang 2005, pp. 21–31. ^ Cox, Christopher R. (July 2009). "True Nature: Surf's Up". Audubon Magazine. Archived from the original on June 3, 2013. Retrieved June 24, 2013. ^ Kjerfve, Björn; Ferreria, Hélder O. (April 1993). "Tidal bores: First ever measurements" (PDF). Ciéncia y Cultura (Journal of the Brazilian Association for the Advancement of Science). 45 (2). Texas A&M University. pp. 135–137. Archived from the original (PDF) on March 4, 2016. Retrieved June 24, 2013. ^ Lingenfelter 1978, pp. 9–13. ^ a b Williams, O.A. (1937). "Settlement and Growth of the Gila Valley as a Mormon Colony, 1879–1900" (PDF). University of Arizona. Archived from the original (PDF) on January 20, 2013. Retrieved February 20, 2012. ^ Glass & Glass 1983, pp. 162–163. ^ Howard, Jerry B. "Hohokam Legacy: Desert Canals". Pueblo Grande Museum Profiles No. 12. WaterHistory.org. Retrieved March 16, 2012. ^ a b "Lees Ferry History". Glen Canyon National Recreational Area. U.S. National Park Service. August 11, 2006. Retrieved February 20, 2012. ^ "Lees Ferry". Arizona State University. July 8, 2010. Archived from the original on June 26, 2012. Retrieved February 20, 2012. ^ Brown 1972, pp. 52–53. ^ Casey 2007, p. 251. ^ Lindberg 2009, pp. 134–135. ^ Kirkemo, Harold (May 21, 2007). "Prospecting for Gold in the United States". General Interest Publications. U.S. Geological Survey. Retrieved February 26, 2012. ^ Apodaca, Lori E.; Stephens, Verlin C.; Driver, Nancy E. (April 1996). "What Affects Water Quality In the Upper Colorado River Basin?" (PDF). National Water-Quality Assessment, Upper Colorado River Basin Fact Sheet FS–109–96. U.S. Geological Survey. Retrieved February 26, 2012. ^ a b United States House of Representatives (1921). Renaming the Grand River, Colo (PDF). Hearing Before the Committee on Interstate and Foreign Commerce of the House of Representatives, Sixty Sixth Congress, Third Session, on HJ 460. p. 19. ^ Colorado River Water Conservation District (December 23, 2003). "Many Years Ago, the Colorado River Was Just Grand". SummitDaily. Retrieved January 5, 2008. ^ Barnes 1988, p. 104. ^ "USGS Gage #09328500 on the San Rafael River near Green River, Utah" (PDF). National Water Information System. U.S. Geological Survey. 1910–2012. Retrieved June 22, 2013. ^ Milstein, Michael (October 1, 2009). "6 Radical Solutions for U.S. Southwest's Peak Water Problem". Popular Mechanics. Retrieved February 18, 2012. ^ "Colorado River Law". Southern Nevada Water Authority. Archived from the original on June 26, 2012. Retrieved February 20, 2012. ^ "Salazar Awards $20.1 Million to Four Western Colorado Irrigation Districts to Improve Irrigation Systems, Reduce Salinity in Colorado River". U.S. Bureau of Reclamation. October 21, 2011. Archived from the original on June 26, 2012. Retrieved March 17, 2012. 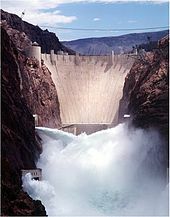 ^ "Low Water May Halt Hoover Dam's Power". Circle of Blue. September 22, 2010. Archived from the original on January 20, 2013. Retrieved October 8, 2012. ^ "Hydropower". Glen Canyon Dam Adaptive Management Program. November 18, 2010. Archived from the original on May 22, 2012. Retrieved May 12, 2012. ^ a b c Davis, Eric F. "The Colorado River Controversy" (PDF). Michigan State University. Archived from the original (PDF) on October 1, 2004. ^ Waterman, Jonathan (August 11, 2010). "Restoring floods to America's Nile". National Geographic. Archived from the original on March 24, 2012. Retrieved March 2, 2012. ^ Nabhan, Gary Paul (January 16, 2007). "The Beginning and the End of the Colorado River: Protecting the Sources, Ensuring its Courses". Northern Arizona University. Archived from the original on December 25, 2011. Retrieved February 20, 2012. ^ Reisner 1993, p. 120. ^ "Appendix I: The Past, Present and Future of Transmountain Diversion Projects" (PDF). Roaring Fork Watershed Plan. Roaring Fork Conservancy. Archived from the original (PDF) on January 20, 2013. Retrieved March 18, 2012. ^ "Transmountain Water Diversions" (PDF). Colorado River District. July 2011. Archived from the original (PDF) on December 1, 2011. Retrieved March 18, 2012. ^ "Colorado-Big Thompson Project". U.S. Bureau of Reclamation. October 18, 2011. Archived from the original on November 12, 2011. Retrieved February 20, 2012. ^ a b Sperry, Robert L. (Winter 1975). "When The Imperial Valley Fought For Its Life". The Journal of San Diego History. San Diego History Center. 21 (1). Retrieved February 20, 2012. ^ Billington, Jackson & Melosi 2005, p. 140. ^ "Origin of the Salton Sea". Suburban Emergency Management Project. Archived from the original on July 18, 2011. ^ Billington, Jackson & Melosi 2005, pp. 141–142. ^ a b "Colorado River Compact, 1922" (PDF). U.S. Bureau of Reclamation. Archived from the original (PDF) on June 26, 2012. Retrieved February 20, 2012. ^ a b "Utilization of Waters of the Colorado and Tijuana Rivers and of the Rio Grande: Treaty Between the United States of America and Mexico" (PDF). International Boundary and Water Commission. February 3, 1944. Retrieved February 20, 2012. ^ a b Anderson, Larry (May 2002). "Utah's Perspective: The Colorado River" (PDF). Utah Division of Water Resources. Archived from the original (PDF) on April 9, 2014. Retrieved February 20, 2012. ^ "The Law of the River". U.S. Bureau of Reclamation. March 2008. Archived from the original on June 26, 2012. Retrieved February 18, 2012. ^ "Boulder Canyon Project – Hoover Dam". U.S. Bureau of Reclamation. February 1, 2012. Archived from the original on October 11, 2012. Retrieved October 9, 2012. ^ "The Colorado River and Hoover Dam: Facts and Figures". U.S. Bureau of Reclamation. January 2012. Archived from the original on June 26, 2012. Retrieved February 20, 2012. ^ "Parker Dam". Parker-Davis Project. U.S. Bureau of Reclamation. June 29, 2009. Archived from the original on June 27, 2012. Retrieved February 20, 2012. ^ "Davis Dam". Parker-Davis Project. U.S. Bureau of Reclamation. June 29, 2009. Archived from the original on June 27, 2012. Retrieved February 20, 2012. ^ "All-American Canal, California–Mexico border". Earth Observatory. National Aeronautics and Space Administration. February 23, 2009. Retrieved February 20, 2012. ^ "All-American Canal System". Boulder Canyon Project. U.S. Bureau of Reclamation. February 1, 2012. Archived from the original on February 26, 2012. Retrieved February 20, 2012. ^ Marie Bell, Tina (1997). "Gila Project" (PDF). U.S. Bureau of Reclamation. Archived from the original (PDF) on February 24, 2012. Retrieved February 28, 2012. ^ "Colorado River". GOOD Magazine. Retrieved February 26, 2012. ^ "Reclamation Helps Celebrate Theodore Roosevelt Dam's 100th Year". U.S. Bureau of Reclamation. March 2011. Archived from the original on June 26, 2012. Retrieved March 16, 2012. ^ "The Colorado River: A Regional Solution". Los Angeles Department of Water and Power. Archived from the original on March 4, 2012. Retrieved February 28, 2012. ^ "San Diego Project". U.S. Bureau of Reclamation. January 11, 2012. Archived from the original on March 16, 2012. Retrieved March 16, 2012. ^ "Nevada". Colorado River Water Users Association. Retrieved November 2, 2013. ^ Fradkin 1996, p. 191. ^ "Moving Water in the Watershed". Blue River Watershed Group. Archived from the original on March 29, 2012. Retrieved May 18, 2012. ^ Wahlstrom, Ernest E. (1974). "History of Geologic Investigations, Engineering Design, and Construction Methods of the Harold D. Roberts Tunnel, Colorado" (PDF). Geological Survey Professional Paper 831–A. U.S. Geological Survey. Retrieved May 18, 2012. ^ "Fryingpan-Arkansas Project". U.S. Bureau of Reclamation. May 10, 2011. Archived from the original on August 27, 2014. Retrieved May 18, 2012. ^ "Colorado River Storage Project". U.S. Bureau of Reclamation. May 4, 2010. Archived from the original on March 3, 2012. Retrieved February 20, 2012. ^ "Chapter IX: Dinosaur National Monument". A Survey of the Recreational Resources of the Colorado River Basin. U.S. National Park Service. September 6, 2004. Retrieved February 20, 2012. ^ "Historic Opposition to Glen Canyon Dam". The End of Lake Powell Campaign. Colorado Riverkeeper. July 20, 2004. Archived from the original on December 28, 2013. Retrieved November 2, 2013. ^ "Resurrection: Buried Treasure". National Audubon Society. 2006. Archived from the original on January 20, 2013. Retrieved February 20, 2012. ^ "Pacific Southwest Water Plan" (PDF). U.S. Bureau of Reclamation. January 21, 1964. Archived from the original (PDF) on September 27, 2012. Retrieved July 15, 2013. ^ a b "Central Arizona Project". U.S. Bureau of Reclamation. April 18, 2011. Archived from the original on June 13, 2011. Retrieved February 20, 2012. ^ Murdock, J. Neil (1996). "Bridge Canyon Dam". from Early History of the Colorado River Storage Project May 1971 U. S. Department of the Interior, Bureau of Reclamation. Grand Canyon River Guides. Retrieved July 15, 2013. ^ "Chapter VII: The Grand Canyon". A Survey of the Recreational Resources of the Colorado River Basin. U.S. National Park Service. September 6, 2005. Archived from the original on November 6, 2013. Retrieved July 15, 2013. ^ Gupta 2007, p. 200. ^ "Why The Colorado River Stopped Flowing". National Public Radio. July 14, 2011. Retrieved February 20, 2012. ^ Weisheit, John. "A Colorado River Sediment Inventory" (PDF). Colorado Plateau River Guides. Retrieved February 20, 2012. ^ "Colorado River Basin". coriverbasin.org. Retrieved May 20, 2013. ^ "Colorado River System Consumptive Uses and Losses Report 1996–2000" (PDF). U.S. Bureau of Reclamation. December 2004. Archived from the original (PDF) on January 19, 2009. ^ Sandra Postel (April 5, 2013). "Landmark Cooperation Brings the Colorado River Home". National Geographic. Retrieved May 19, 2014. ^ a b Morford, Scott. "Salinity in the Colorado River Basin" (PDF). UC Davis Center for Watershed Sciences. Retrieved February 23, 2017. ^ Oyarzabal-Tamargo, Francisco; Young, Robert A. (June 1977). "The Colorado River Salinity Problem: Direct Economic Damages in Mexico" (PDF). University of Minnesota. Retrieved February 20, 2012. ^ a b "Colorado River Basin Salinity Control Program" (PDF). Southern California Salinity Coalition. Retrieved June 29, 2013. ^ "Colorado River Basin Salinity Control Project". U.S. Bureau of Reclamation. April 18, 2011. Archived from the original on February 28, 2012. Retrieved February 21, 2012. ^ "Technical Report: Pesticides in the Lower Colorado River". Surveillance and Analysis Division, Report No. 002–73. U.S. Environmental Protection Agency. April 1973. Retrieved June 29, 2013. ^ "About Region 7". Colorado River Basin Regional Water Quality Control Board. California Environmental Protection Agency. Retrieved June 29, 2011. ^ Polakovic, Gary. "A Sea in Trouble". The Press-Enterprise. San Diego State University. Retrieved June 29, 2011. ^ Bauch, Nancy J.; Spahr, Norman E. (2000). "Pesticides in Surface Waters of the Upper Colorado River Basin, Colorado, 1996–98" (PDF). Water-Resources Investigation Report 00-4005. U.S. Geological Survey. Retrieved June 29, 2013. ^ "Grand Canyon". Glen Canyon Institute. Archived from the original on February 24, 2012. Retrieved February 21, 2012. ^ Clarkson, Robert W.; Childs, Michael R. (May 8, 2000). "Temperature Effects of Hypolimnial-Release Dams on Early Life Stages of Colorado River Basin Big-River Fishes". Copeia. 2000 (2): 402–412. doi:10.1643/0045-8511(2000)000[0402:teohrd]2.0.co;2. ^ Ghiglieri & Myers 2001, pp. 194–214. ^ Margolis, Jason; Mullins, Lisa (November 26, 2012). "Colorado River Agreement to Help Restore Vanished Wetlands in Mexico". The World. Public Radio International. Retrieved November 2, 2013. ^ "Minute 319: Building on the Past to Provide for the Future" (PDF). River Report. Water Education Foundation. 2012–2013. Archived from the original (PDF) on May 1, 2014. Retrieved June 29, 2013. ^ a b Hodson, Hal (March 12, 2014). "Huge water pulse to bring Colorado river back from dead". New Scientist. Retrieved May 19, 2014. ^ Hodson, Hal (May 19, 2014). "Colorado river reaches sea for first time in decades". New Scientist. Retrieved May 19, 2014. ^ Galvan, Astrid (May 19, 2014). "Colorado River Reaches Gulf". ABC and Associated Press. Retrieved May 19, 2014. ^ Reisner 1993, p. 121. ^ Reisner 1993, p. 126. ^ Stahle, David W.; Fye, Falko K.; Therrell, Matthew D. (2003). "Interannual to Decadal Climate and Streamflow Variability Estimated from Tree Rings". Developments in Quaternary Science. pp. 491–504. ^ "Upper Colorado River Basin Consumptive Uses and Losses Report 2006-2010" (PDF). U.S. Bureau of Reclamation. August 2012. Archived from the original (PDF) on October 10, 2012. Retrieved June 29, 2013. ^ a b Gelt, Joe (August 1997). "Sharing Colorado River Water: History, Public Policy and the Colorado River Compact". Arroyo. University of Arizona, Water Resources Research Center. 10 (1). Retrieved February 25, 2014. ^ Weisheit, John. "Persistent Drought In The Colorado River Basin" (PDF). Confluence. Retrieved May 15, 2012. ^ Woodhouse, Connie; Webb, Robert S.; Lukas, Jeff. "Paleoenvironmental Archives as a source of Climate Information for Natural Resource Management: An Example from Tree Rings and Colorado Water Management" (PDF). U.S. Forest Service. Retrieved May 19, 2012. ^ "Annual Operating Plan for Colorado River Reservoirs – 2012" (PDF). U.S. Bureau of Reclamation. 2012. Archived from the original (PDF) on September 21, 2012. Retrieved April 22, 2012. ^ "Mission 2012: Clean Water". Massachusetts Institute of Technology. Retrieved February 21, 2012. ^ Vernieu-Presenter, William S. (2005). "Current Status and Trends of Lake Powell and Glen Canyon Dam Release Water Quality" (PDF). U.S. Geological Survey, Grand Canyon Monitoring and Research Center. Grand Canyon River Guides. Retrieved May 15, 2012. ^ Hoerling, Martin; Eischeid, Jon (November 17, 2006). "Outlook for Water in the West at 2050" (PDF). NOAA Earth System Research Laboratory, Climate Change Workshop. Western Water Assessment. Archived from the original (PDF) on June 9, 2010. ^ Kuhn, Eric (January 26, 2007). "The Colorado River's Uncertain Future: How Climate Change May Affect Future Planning Decisions on the Colorado River" (PDF). CRWCD 49th Annual Convention. Colorado River Water Conservation District. Archived from the original (PDF) on December 1, 2011. Retrieved February 21, 2012. ^ Rake, Launce (December 31, 2006). "Chasing Lake Mead's Water: Part 3 of 3". Las Vegas Sun. Retrieved March 17, 2012. ^ Spotts, Peter N. (April 13, 2008). "Lakes Mead and Powell Could Run Dry by 2021". Christian Science Monitor. Retrieved February 21, 2012. ^ McKinnon, Shaun (October 19, 2010). 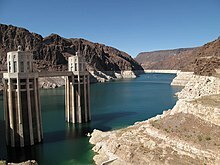 "Lake Mead Sinks to a New Historic Low: If Lake Falls 8 More Feet, Thirsty Ariz. Could Experience Water Restrictions". The Arizona Republic. Phoenix, Arizona. Retrieved September 6, 2012. ^ McKinnon, Shaun (April 19, 2011). "Lake Mead Replenished by Snowfall". azcentral.com. Retrieved February 21, 2012. ^ Shine, Conor (August 17, 2011). "Lake Mead's water level rises 30 feet after wet winter". Las Vegas Sun. Retrieved February 21, 2012. ^ Perry, Tony (May 27, 2013). "As Colorado River drought worsens, water officials parley". Los Angeles Times. Retrieved July 9, 2013. ^ Johnson, Terrell (August 20, 2013). "Dwindling Colorado River Forces First-Ever Cuts in Lake Powell Water Releases". The Weather Channel. Archived from the original on January 13, 2014. Retrieved January 16, 2014. ^ Brean, Henry (July 11, 2014). "Lake Mead sinks to a record low". Las Vegas Review-Journal. Retrieved October 2, 2014. ^ Hiltzik, Michael (June 20, 2014). "Water war bubbling up between California and Arizona". Los Angeles Times. Retrieved September 23, 2014. ^ Pyper, Julia (July 21, 2011). "Colorado River Faces Flood and Drought – Becoming Less Reliable?". Scientific American. Retrieved February 21, 2012. ^ Sevigny, Melissa (May 17, 2018). "Colorado River Water Shortage Could be Declared in 2020". KNAU. Retrieved May 24, 2018. ^ Chow, Lorraine (May 17, 2018). "Unprecedented Colorado River Water Shortage Could Be Declared in 2020". EcoWatch. Retrieved May 24, 2018. ^ "Biotic Communities of the Colorado Plateau: Riparian Areas". Land Use History of North America. Northern Arizona University. Archived from the original on February 13, 2012. Retrieved February 23, 2012. ^ Ohmart, Robert D.; Anderson, Bertin W.; Hunter, William C. (September 1988). "The Ecology of the Lower Colorado River from Davis Dam to the Mexico-United States International Boundary: A Community Profile" (PDF). U.S. Fish and Wildlife Service. pp. 9, 12, 14. Retrieved June 29, 2013. ^ Shanahan, S.A.; Nelson, S.M. ; Van Dooremolen, D.M. ; Eckberg, J.R. (2011). "Restoring Habitat for Riparian Birds in the Lower Colorado River Watershed: An Example from the Las Vegas Wash, Nevada" (PDF). Journal of Arid Environments. 75 (11): 1182–1190. Bibcode:2011JArEn..75.1182S. doi:10.1016/j.jaridenv.2011.06.017. ^ Alles, David L. (August 8, 2007). "The Delta of the Colorado River" (PDF). Western Washington University. Retrieved February 23, 2012. ^ Schell, Robert; King, Morgan E. "Riparian Vegetation: Structural Diversity Benefits Birds" (PDF). University of California, Davis. Archived from the original (PDF) on December 6, 2011. Retrieved February 23, 2012. ^ "Status of Plant and Animal Life". A Survey of the Recreational Resources of the Colorado River Basin. U.S. National Park Service. September 6, 2004. Retrieved February 23, 2012. ^ Benke & Cushing 2005, p. 493. ^ "130: Colorado". Freshwater Ecoregions of the World. January 11, 2012. Archived from the original on June 18, 2012. Retrieved February 23, 2012. ^ "Colorado River Basin Fish". Defenders of Wildlife. Archived from the original on April 6, 2011. ^ Shorey, Ananda (December 23, 2004). "River May Be Getting More Rafters". Deseret News. Salt Lake City, Utah. Associated Press. Retrieved June 29, 2013. ^ Blond, Dunford & Schulte-Peevers 2008, p. 87. ^ "River Trips/Permits". Grand Canyon National Park. U.S. National Park Service. July 25, 2011. Retrieved February 23, 2012. ^ Jones, Melissa L. (June 9, 2006). "Rafting the Colorado River Through the Grand Canyon". azcentral.com. Retrieved February 23, 2012. ^ a b "Upper Colorado Special Recreation Management Area". U.S. Bureau of Land Management. September 29, 2011. Archived from the original on March 6, 2012. Retrieved March 12, 2012. ^ "Recreation Fee Account Accomplishments: Colorado River (Moab)" (PDF). U.S. Bureau of Land Management. Archived from the original (PDF) on October 27, 2012. Retrieved May 13, 2012. ^ Powell 2003, p. 345. ^ Armstead 1997, p. 143. ^ "National Parks of the Colorado River Basin: Water Resources, Threats and Economics" (PDF). National Parks Conservation Association. April 2011. Archived from the original (PDF) on July 9, 2012. Retrieved June 24, 2013. ^ Driver, Nancy E. (April 15, 2013). "Effects of Mining on Water Quality in Upper Colorado River Basin". National Water-Quality Assessment Program – Upper Colorado River Basin Study Unit. U.S. Geological Survey. Archived from the original on September 19, 2015. Retrieved June 24, 2013. ^ "Glen Canyon National Recreation Area Expanded Zebra Mussel Action Plan" (PDF). Glen Canyon National Recreation Area. U.S. National Park Service. Retrieved February 23, 2012. ^ "Lake Mead Proves Popular During Economic Downturn". Lake Mead National Recreation Area. U.S. National Park Service. February 5, 2009. Retrieved February 23, 2012. ^ O'Donoghue, Amy Joi (August 16, 2013). "Worst Colorado River drought in century prompts feds to cut releases from Lake Powell". Deseret News. Retrieved August 22, 2013. Annerino, John (1999). Canyoneering: How to Explore the Canyons of the Great Southwest. Stackpole Books. ISBN 978-0-8117-2700-6. Armstead, Lloyd Dean (1997). Whitewater Rafting in North America: More than 100 River Adventures in the United States and Canada. Globe Pequot. ISBN 978-0-7627-0083-7. Axelrod, Alan; Phillips, Charles (2008). What Every American Should Know About American History: 225 Events That Shaped The Nation. Adams Media. ISBN 978-1-59869-428-4. Barnes, Will Croft (1988). Arizona Place Names. University of Arizona Press. ISBN 978-0-8165-1074-0. Benke, Arthur C.; Cushing, Colbert E. (2005). Rivers of North America. Academic Press. ISBN 978-0-12-088253-3. Billington, David P.; Jackson, Donald C.; Melosi, Martin V. (2005). "The History of Large Federal Dams: Planning, Design and Construction in the Era of Big Dams" (PDF). U.S. Bureau of Reclamation. Archived from the original (PDF) on February 22, 2012. Retrieved April 22, 2012. Blond, Becca; Dunford, Lisa; Schulte-Peevers, Andrea (2008). Southwest USA. Lonely Planet Travel Guides. Lonely Planet. ISBN 978-1-74104-713-4. Bolton, Herbert Eugene (2017). Rim of Christendom: A Biography of Eusebio Francisco Kino: Pacific Coast Pioneer. University of Arizona Press. ISBN 978-0-8165-3570-5. Brown, Robert Leaman (1972). Colorado Ghost Towns – Past and Present. Caxton Press. ISBN 978-0-87004-218-8. Casey, Robert L. (2007). Journey to the High Southwest: A Traveler's Guide to Santa Fe and the Four Corners of Arizona, Colorado, New Mexico, and Utah. Globe Pequot. ISBN 978-0-7627-4064-2. Dolnick, Edward (2002). Down the Great Unknown: John Wesley Powell's Journey of Discovery and Tragedy Through the Grand Canyon. HarperCollins. ISBN 978-0-06-095586-1. Felger, Richard Stephen; Broyles, Bill (2007). Dry borders: great natural reserves of the Sonoran desert. University of Utah Press. ISBN 978-0-87480-818-6. Fielder, John (2002). John Fielder's Best of Colorado. Big Earth Publishing. ISBN 978-1-56579-429-0. Fradkin, Philip L. (1996). A River No More: The Colorado River and the West (2 ed.). University of California Press. ISBN 978-0-520-20564-2. Glass, Mary Ellen; Glass, Al (1983). Touring Nevada: A Historic and Scenic Guide. University of Nevada Press. ISBN 978-0-87417-074-0. Gudde, Erwin G.; Bright, William (2004). California Place Names: The Origin and Etymology of Current Geographical Names. University of California Press. ISBN 978-0-520-24217-3. Gupta, Avijit (2007). Large Rivers: Geomorphology and Management. John Wiley and Sons. ISBN 978-0-470-84987-3. Gupta, S.K. (2010). Modern Hydrology and Sustainable Water Development. John Wiley & Sons. ISBN 978-1-4443-2397-9. Ghiglieri, Michael P.; Myers, Thomas M. (2001). Over the Edge: Death in Grand Canyon (1st, tenth revision ed.). Flagstaff: Puma Press. ISBN 978-0-9700973-1-6. Hopkins, Ralph Lee (2002). Hiking the Southwest's Geology: Four Corners Region. The Mountaineers Books. ISBN 978-1-59485-169-8. Kessel, William B.; Wooster, Robert (2005). Encyclopedia Of Native American Wars And Warfare. Infobase Publishing. ISBN 978-0-8160-3337-9. Lankford, Andrea (2010). Ranger Confidential: Living, Working, and Dying in the National Parks. Globe Pequot. ISBN 978-0-7627-5263-8. Leuchtenburg, William Edward (2000). American Places: Encounters with History. Oxford University Press. ISBN 978-0-19-513026-3. Leopold, Luna Bergere (1994). A View of the River. Harvard University Press. ISBN 978-0-674-93732-1. Lindberg, Eric (2009). Colorado Off the Beaten Path: A Guide to Unique Places. Globe Pequot. ISBN 978-0-7627-5024-5. Lingenfelter, Richard E. (1978). Steamboats on the Colorado River, 1852–1916. University of Arizona Press. ISBN 978-0-8165-0650-7. Logan, Michael F. (2006). Desert Cities: The Environmental History of Phoenix and Tucson. University of Pittsburgh Press. ISBN 978-0-8229-4294-8. National Research Council (U.S.), Committee to Review the Glen Canyon Environmental Studies (1996). River Resource Management in the Grand Canyon. National Academy Press. ISBN 978-0-309-05448-5. Nobles, Gregory H. (1998). American Frontiers: Cultural Encounters and Continental Conquest. Macmillan. ISBN 978-0-8090-1602-0. Powell, Allan Kent (2003). The Utah Guide (3 ed.). Fulcrum Publishing. ISBN 978-1-55591-114-0. Prisciantelli, Tom (2002). Spirit of the American Southwest: Geology, Ancient Eras and Prehistoric People, Hiking Through Time. Sunstone Press. ISBN 978-0-86534-354-2. Pritzker, Barry (1998). Native Americans: An Encyclopedia of History, Culture, and Peoples. 1. ABC-CLIO. ISBN 978-0-87436-836-9. Reisner, Marc (1993). Cadillac Desert. Penguin. ISBN 978-0-14-017824-1. Rolle, Andrew (1999). John Charles Fremont: Character As Destiny. University of Oklahoma Press. ISBN 978-0-8061-3135-1. Schmidt, Jeremy (1993). Grand Canyon National Park: A Natural History Guide. Houghton Mifflin Harcourt. ISBN 978-0-395-59932-7. Van Cott, John W. (1990). Utah Place Names: A Comprehensive Guide to the Origins of Geographic Names. University of Utah Press. ISBN 978-0-87480-345-7. Wildfang, Frederic B. (2005). Lake Havasu City. Images of America. Arcadia Publishing. ISBN 978-0-7385-3012-3. Wiltshire, Richard L.; Gilbert, David R.; Rogers, Jerry R., eds. (2010). Hoover Dam 75th Anniversary History Symposium: Proceedings of the Hoover Dam 75th Anniversary History Symposium, October 21–22, 2010, Las Vegas, Nevada. ASCE Publications. ISBN 978-0-7844-1141-4. Young, Richard A.; Spamer, Earle E. (2001). The Colorado River: Origin and Evolution. Grand Canyon Association. ISBN 978-0-938216-79-7. Darrah, William Culp, Ralph V. Chamberlin, and Charles Kelly, editors. (2009). The Exploration of the Colorado River in 1869 and 1871–1872: Biographical Sketches and Original Documents of the First Powell Expedition of 1869 and the Second Powell Expedition of 1871–1872. ISBN 978-0-87480-963-3. Wikimedia Commons has media related to Colorado River.